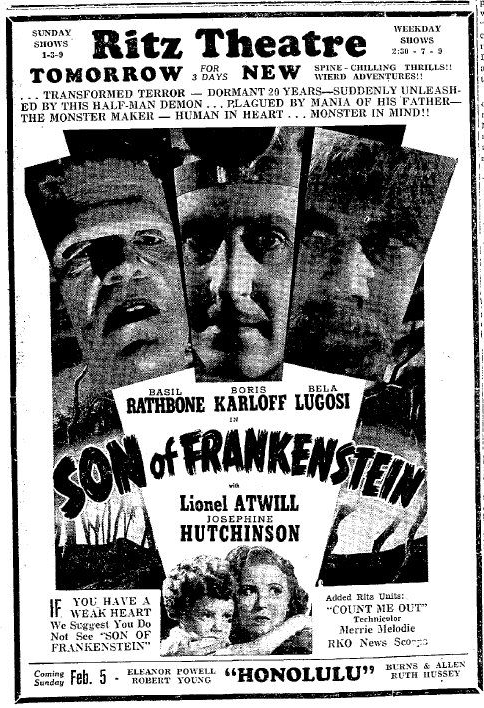 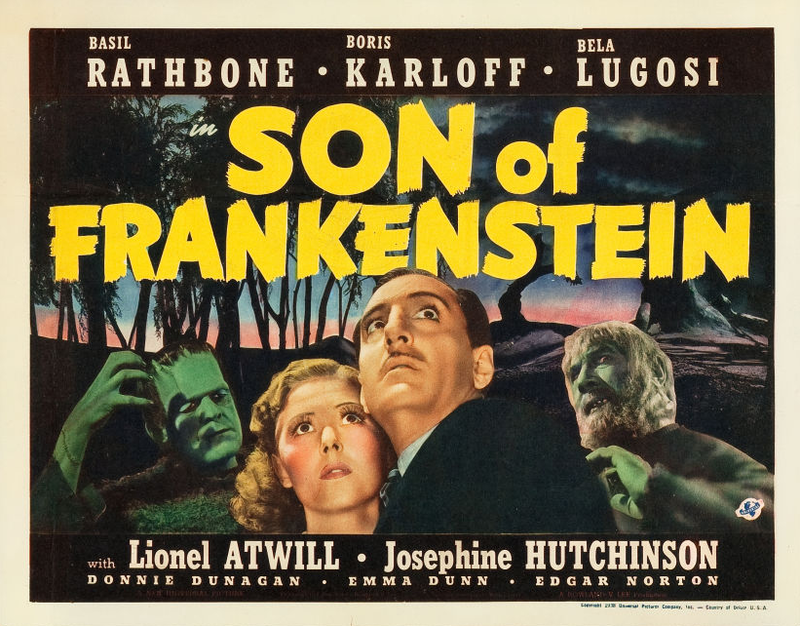 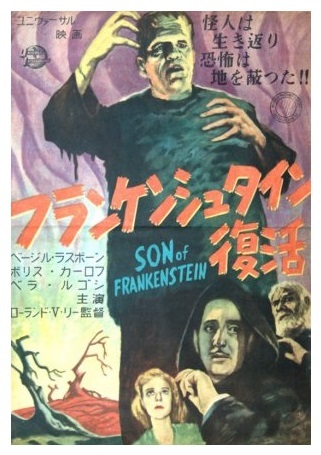 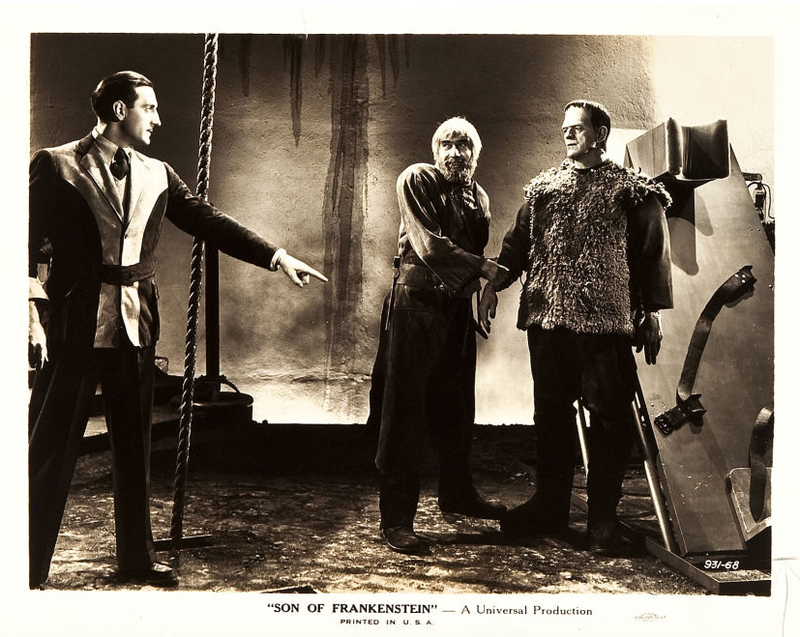 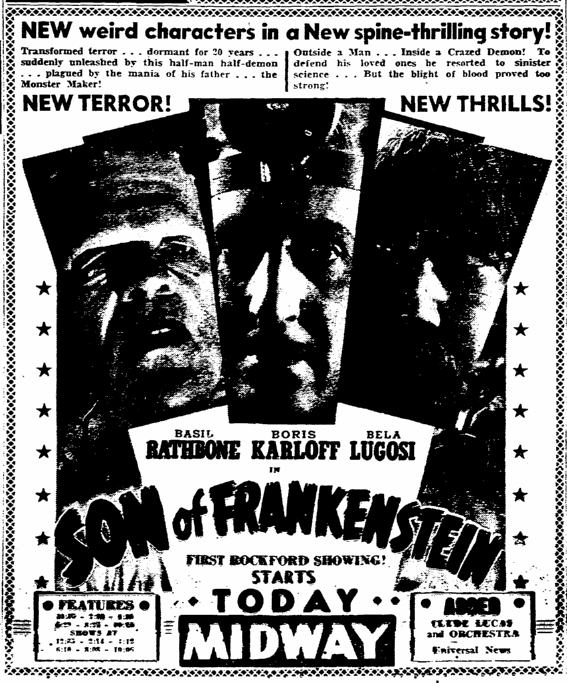 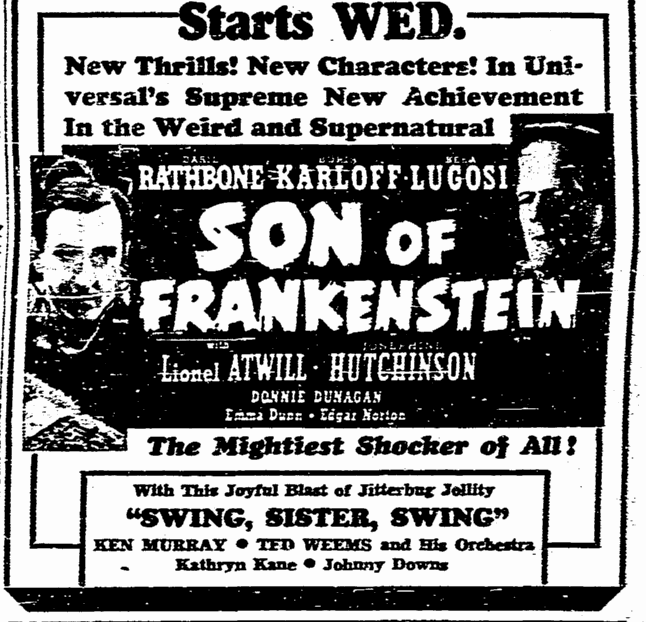 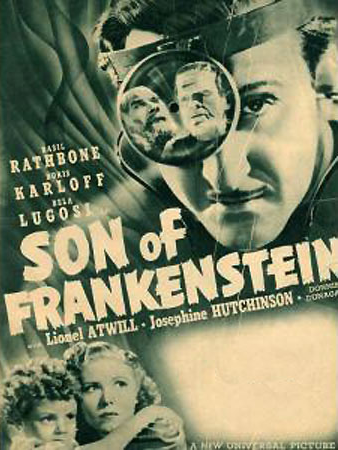 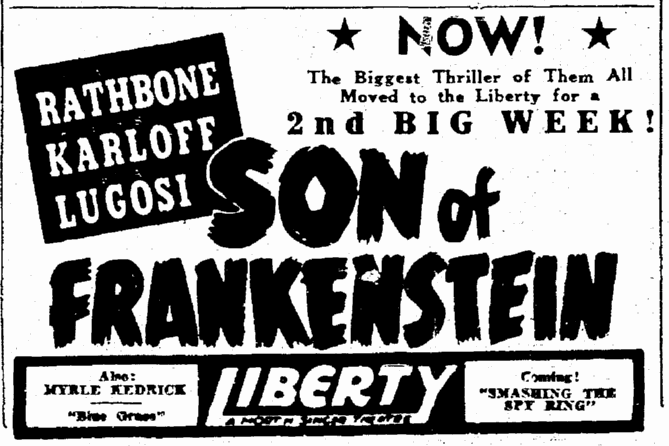 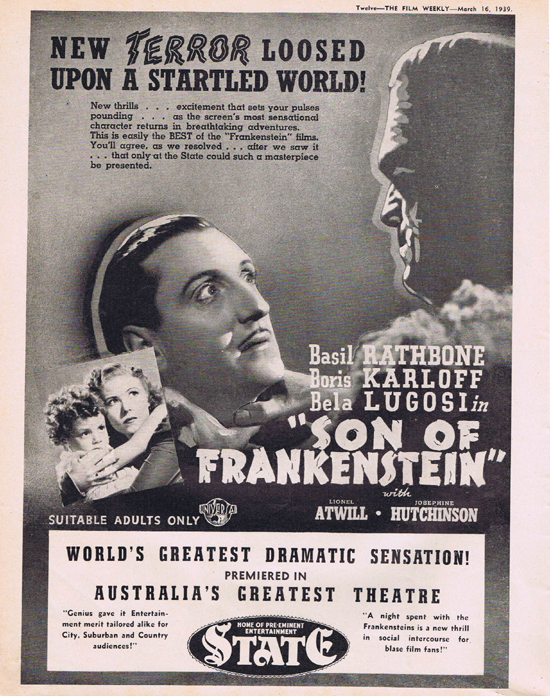 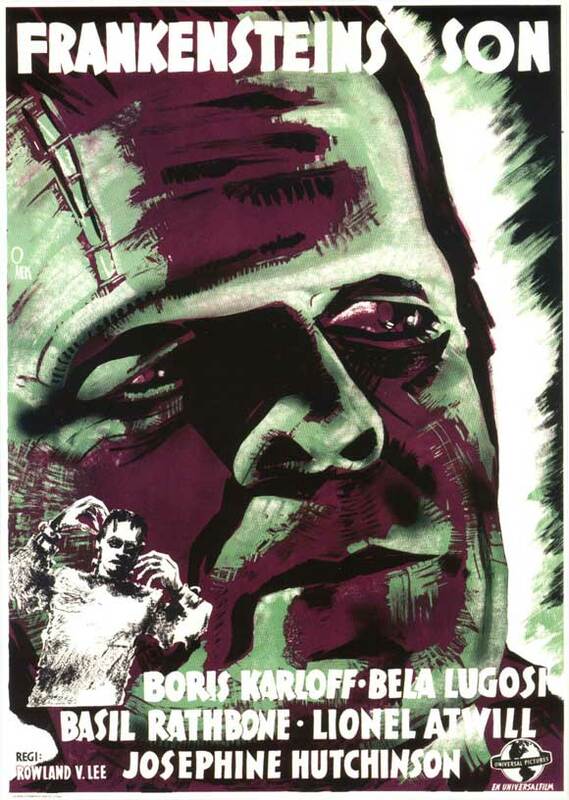 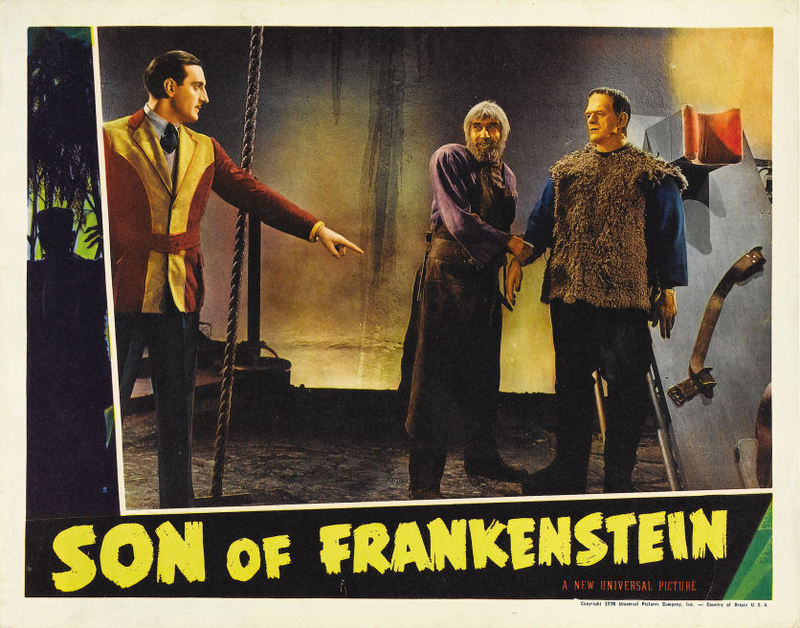 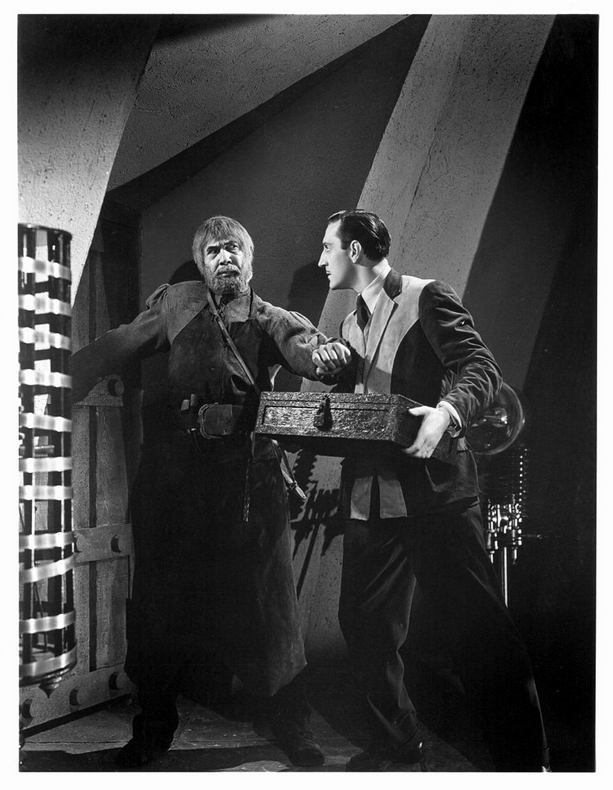 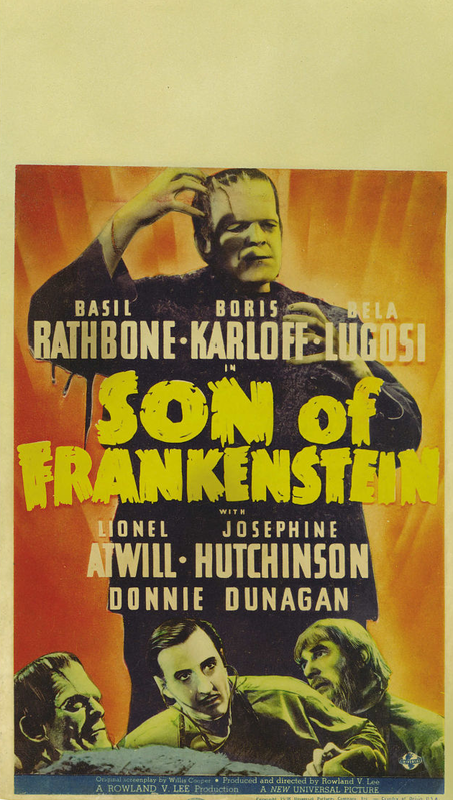 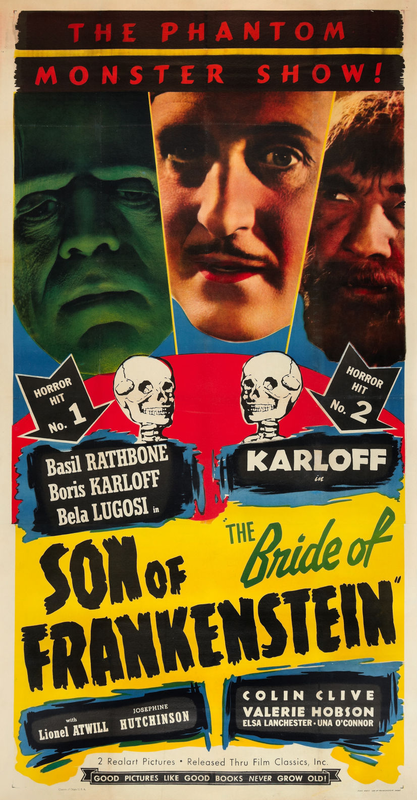 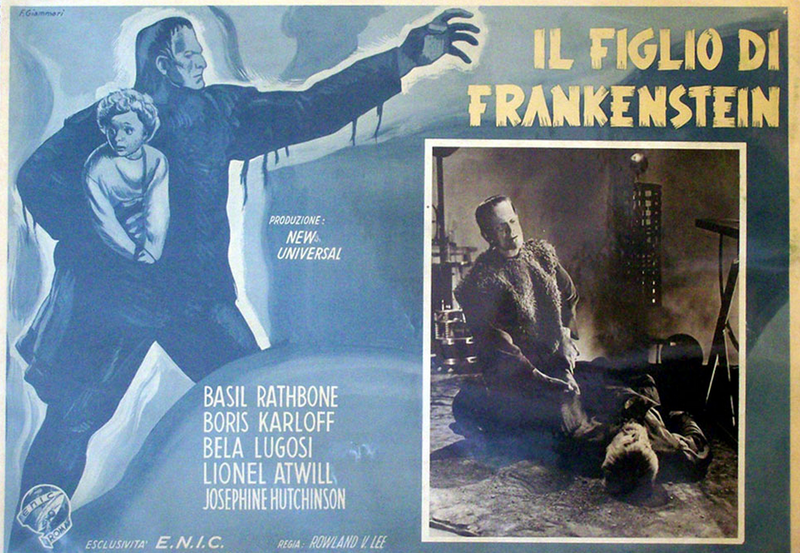 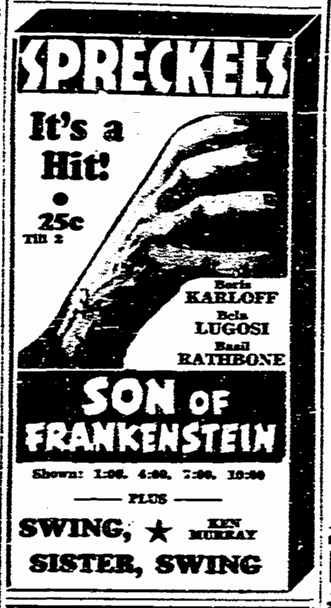 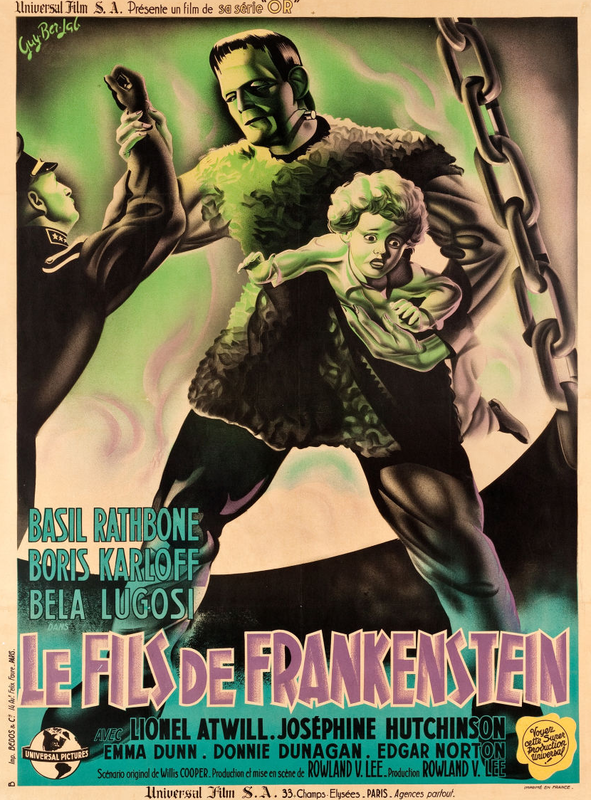 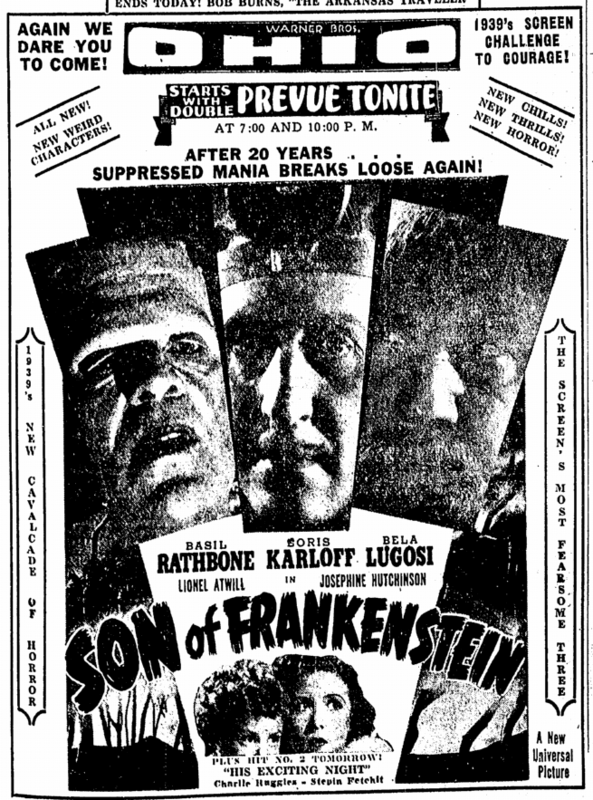 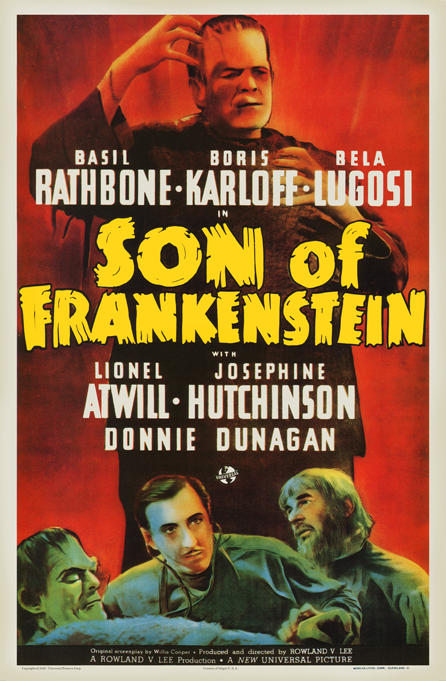 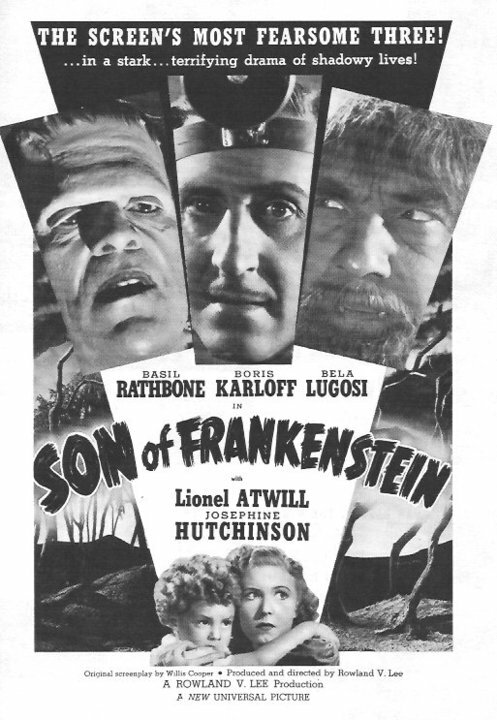 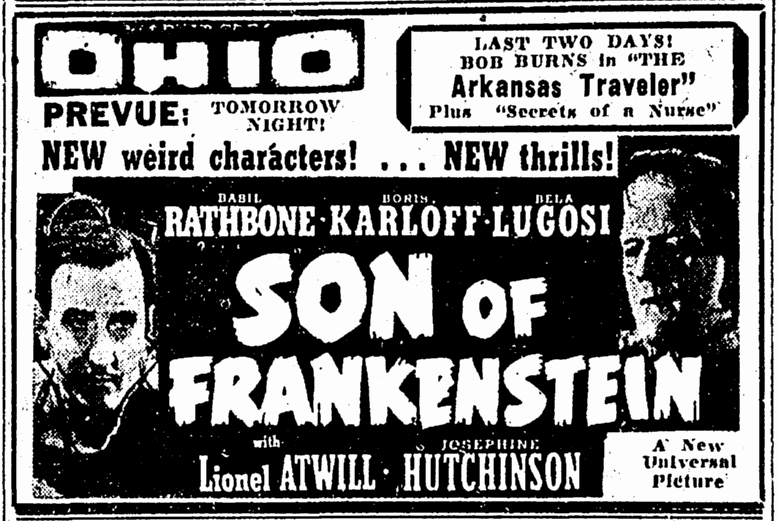 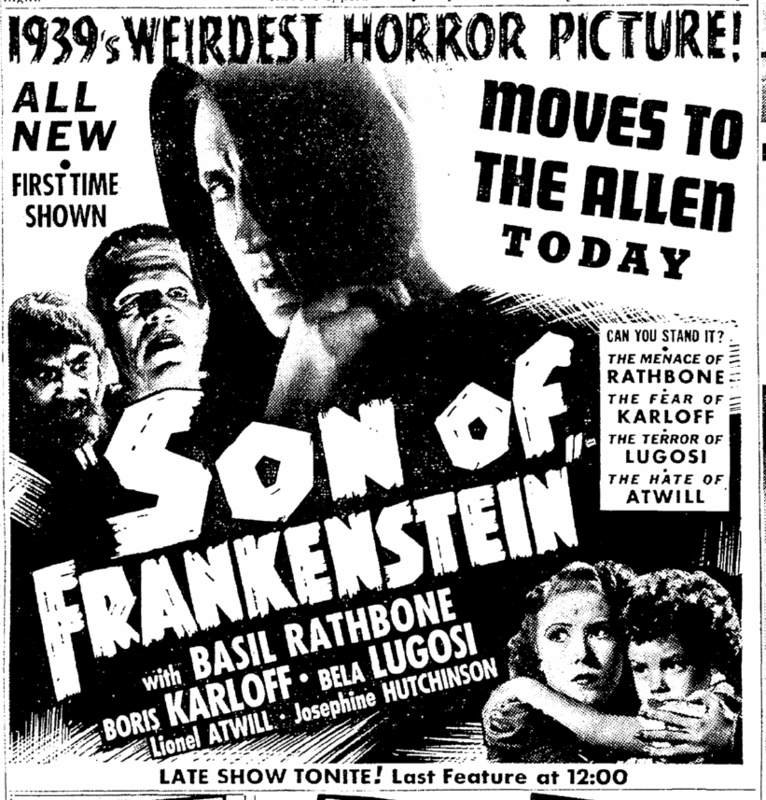 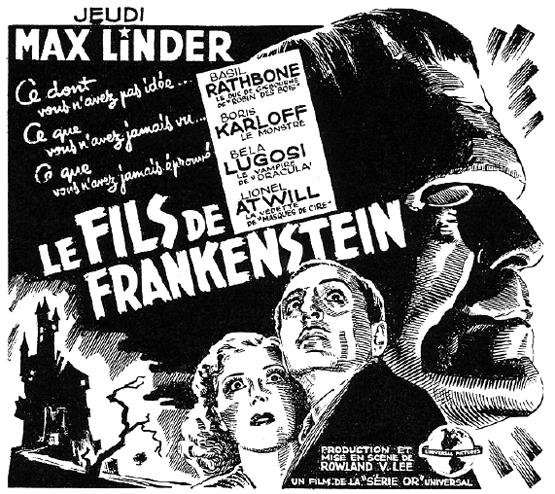 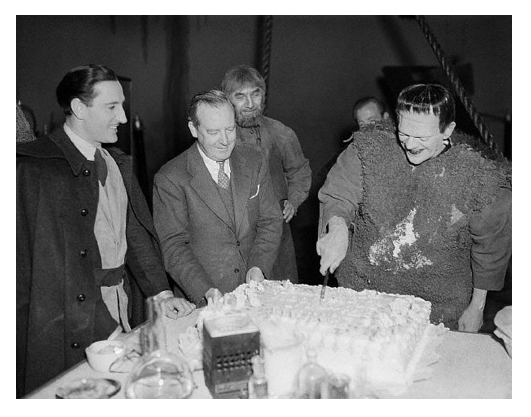 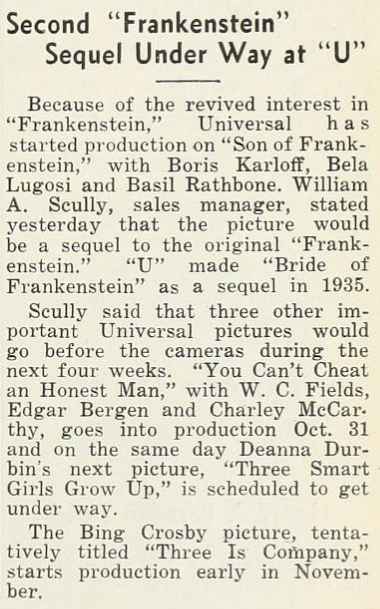 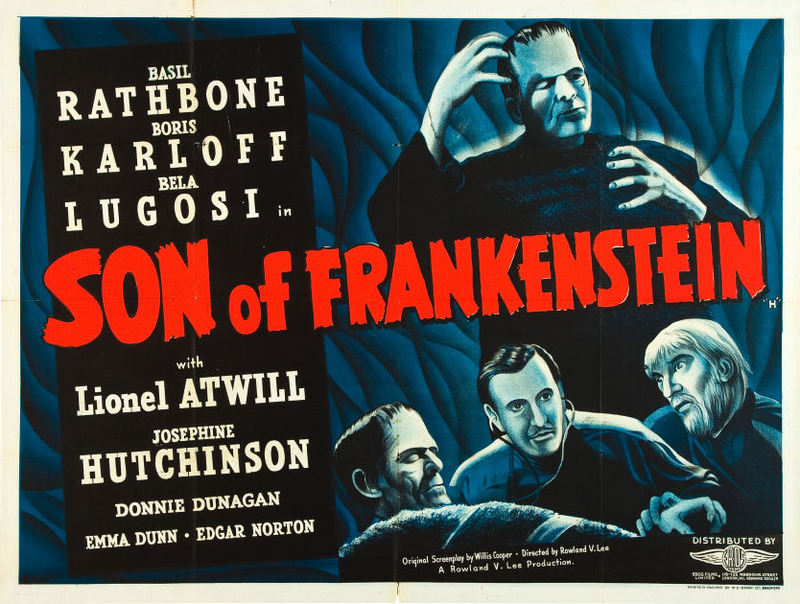 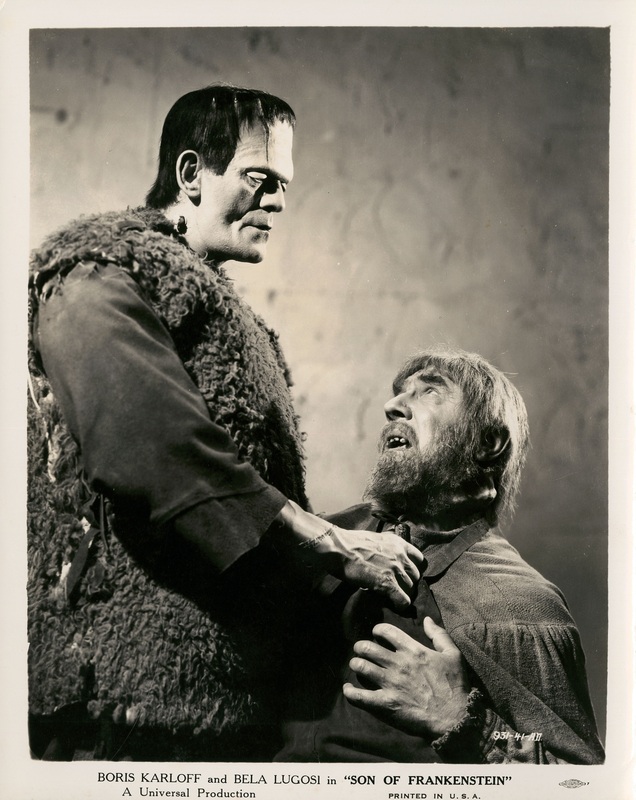 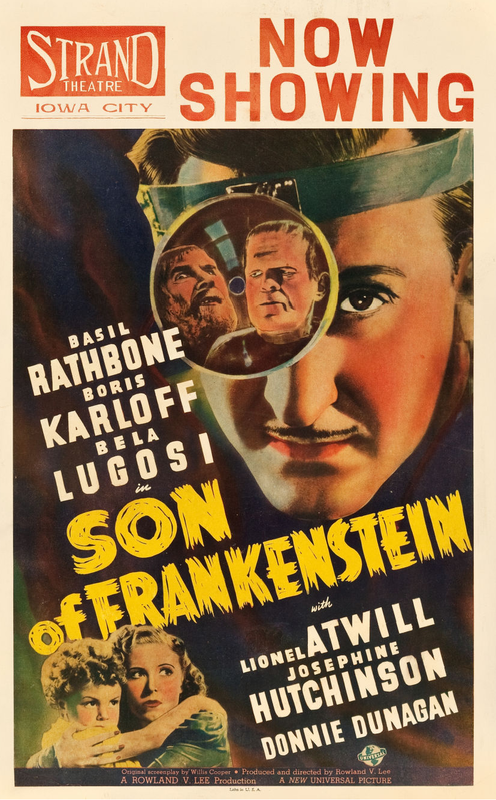 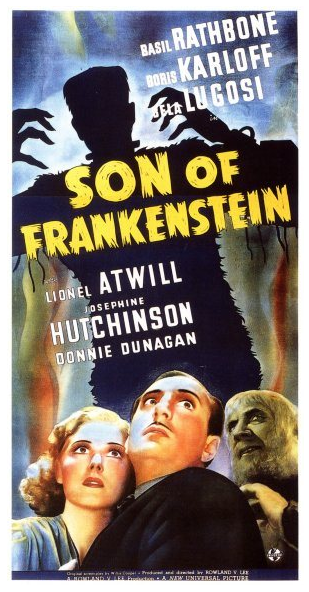 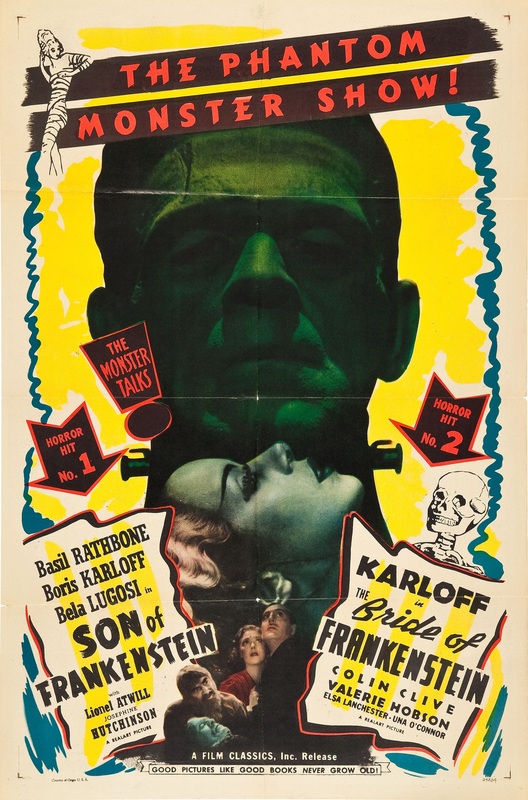 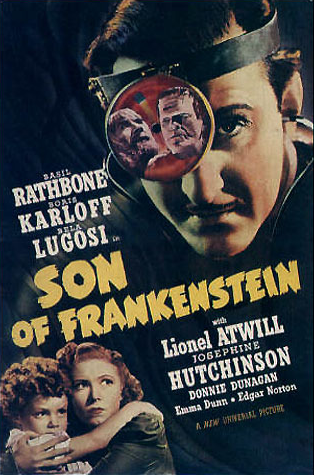 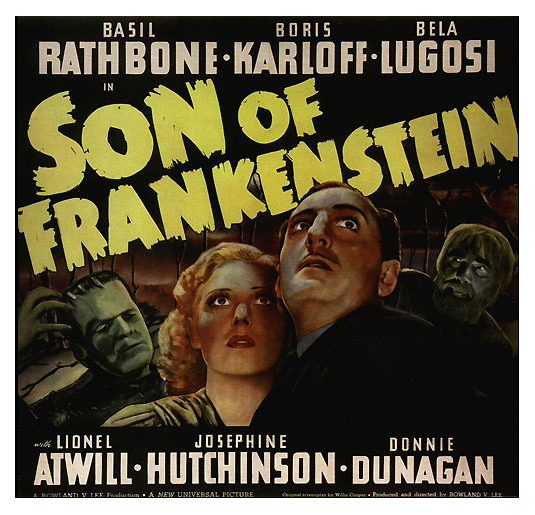 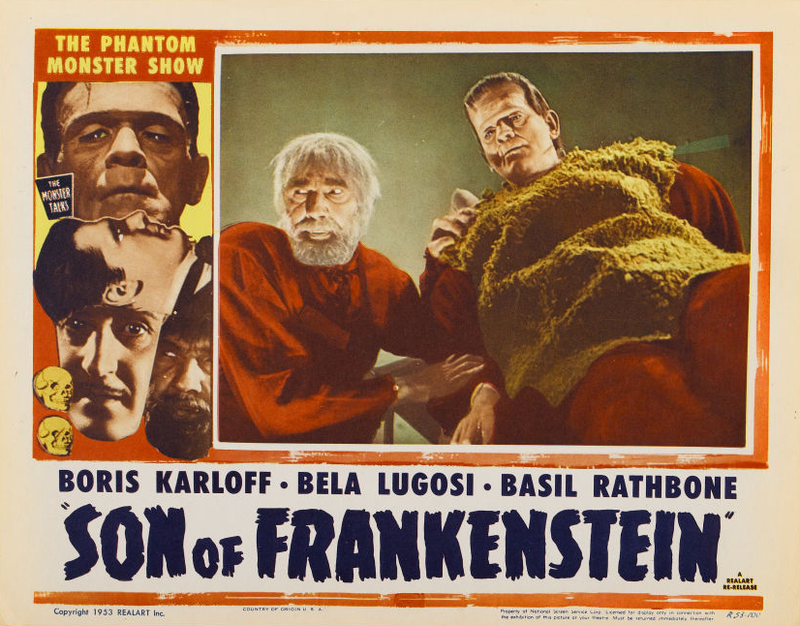 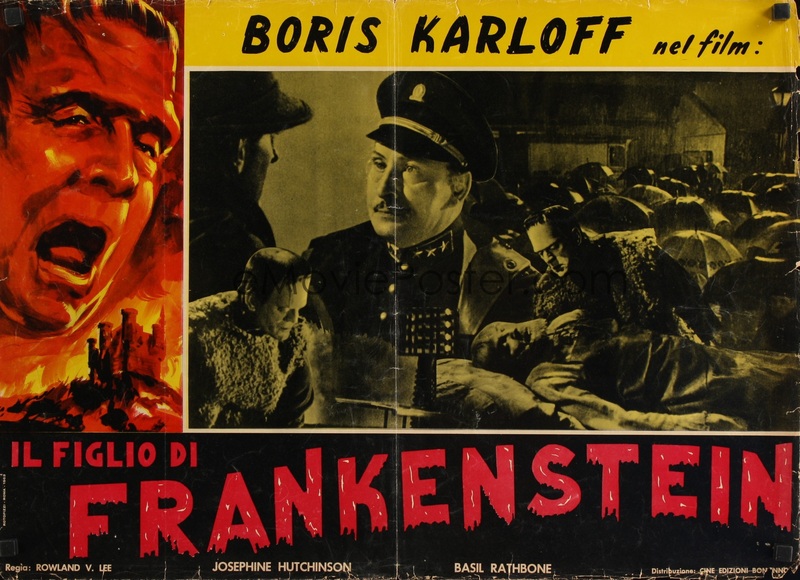 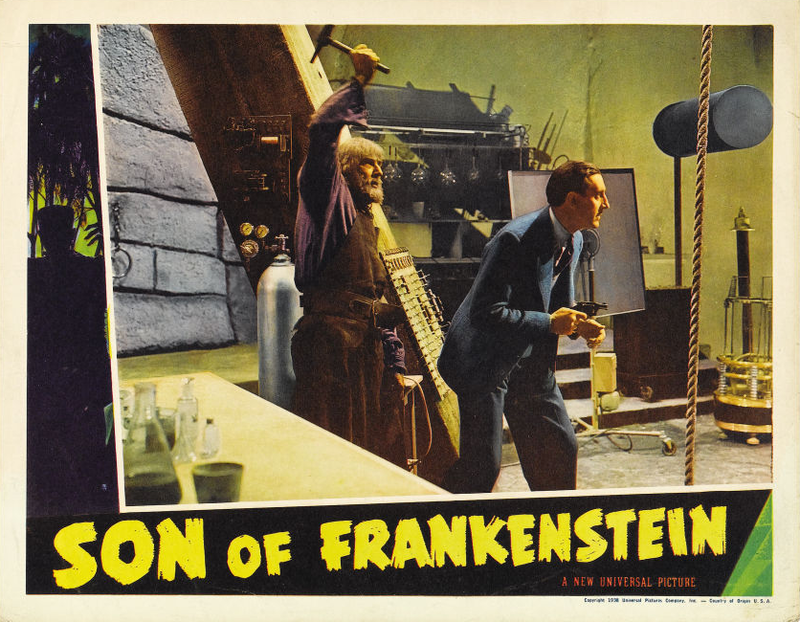 ‘U’ has upped the budget for “Son Of Frankenstein” a half million dollars and added Lionel Atwill to the cast which includes Basil Rathbone, and Boris Karloff and Bela Lugosi. 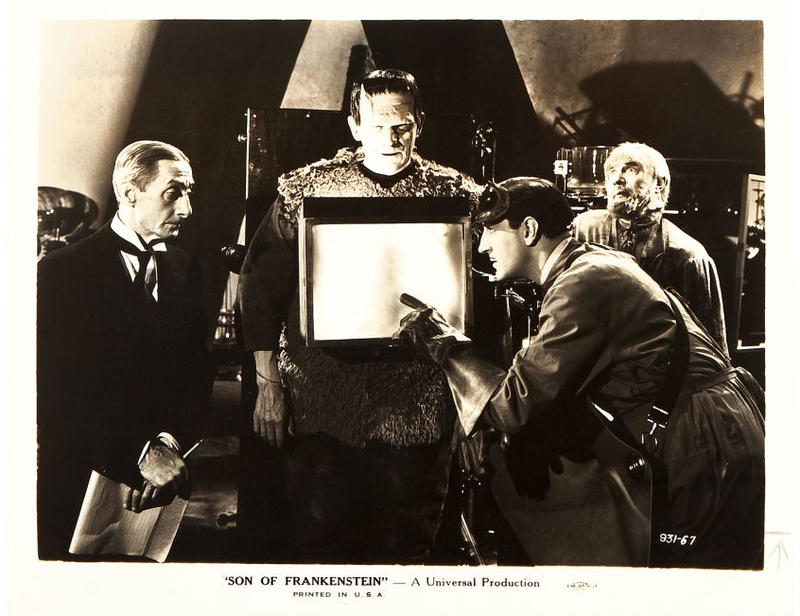 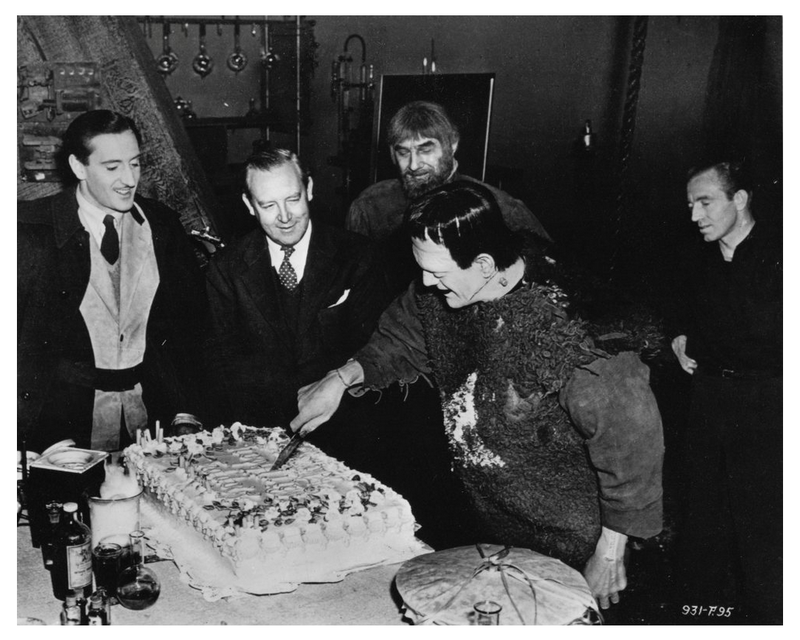 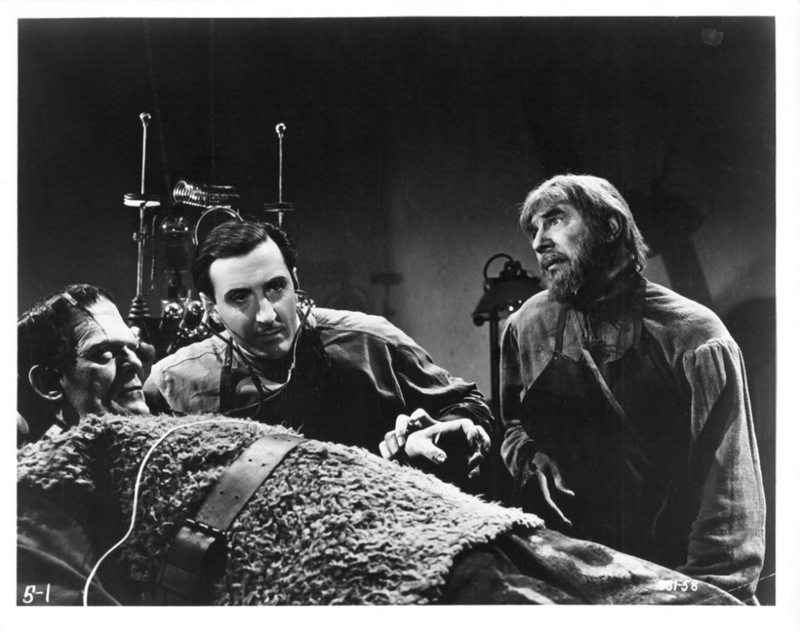 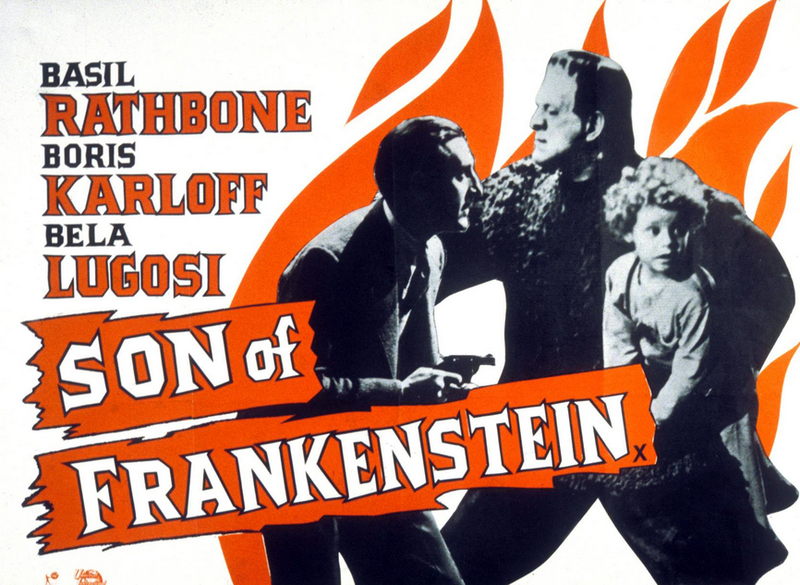 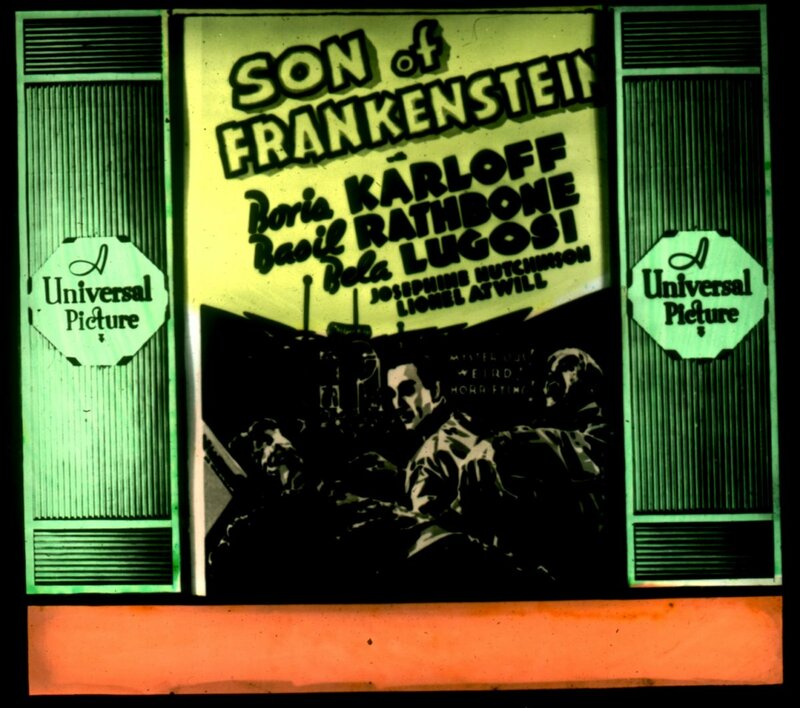 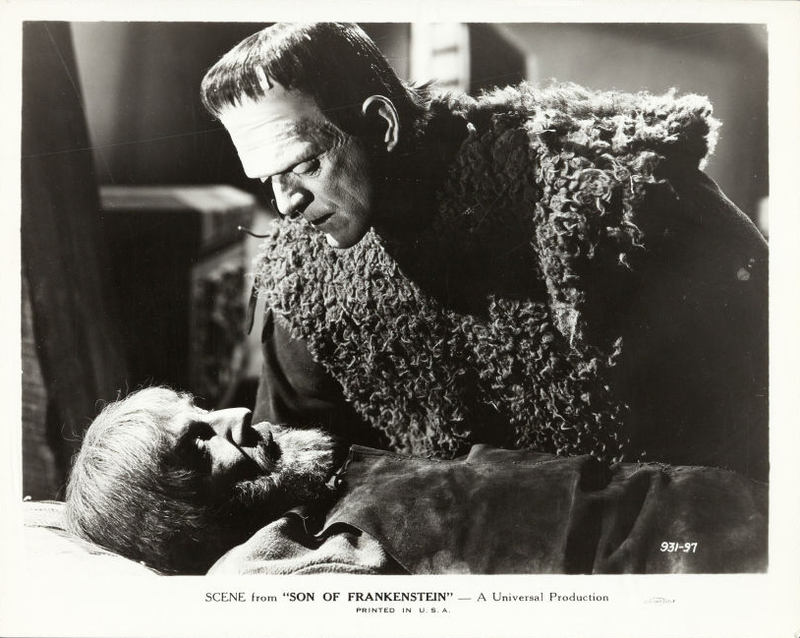 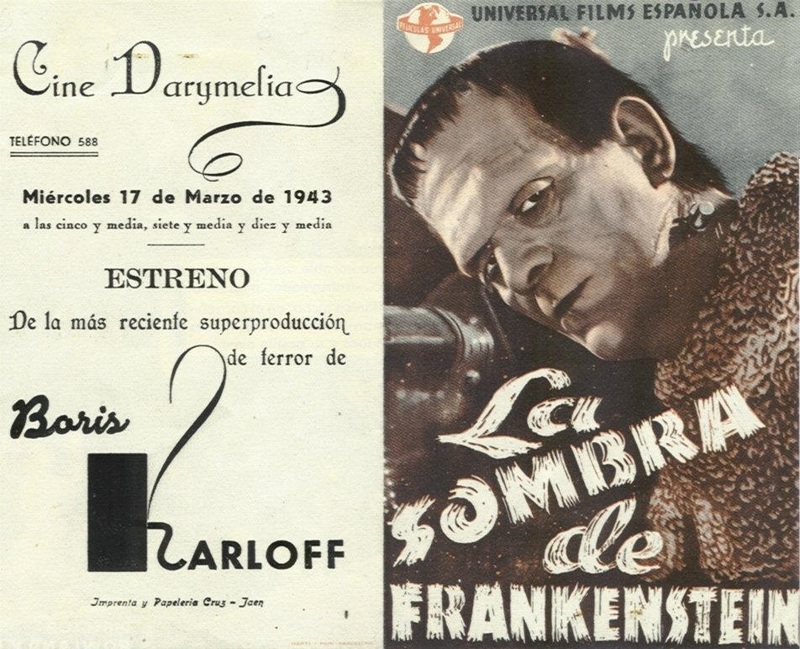 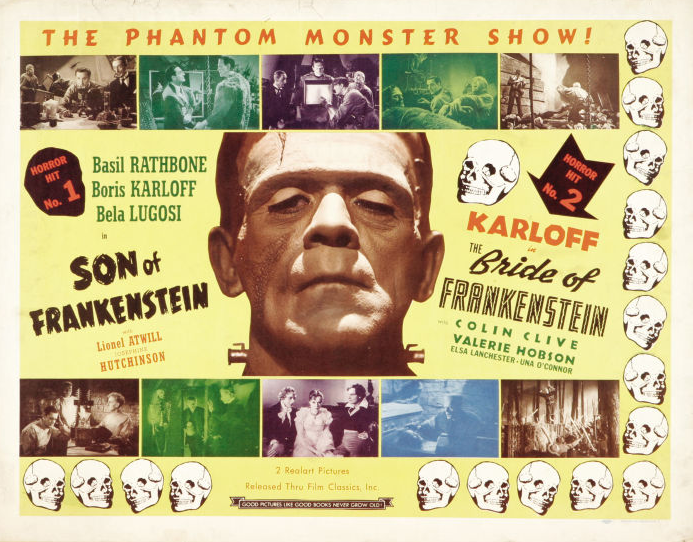 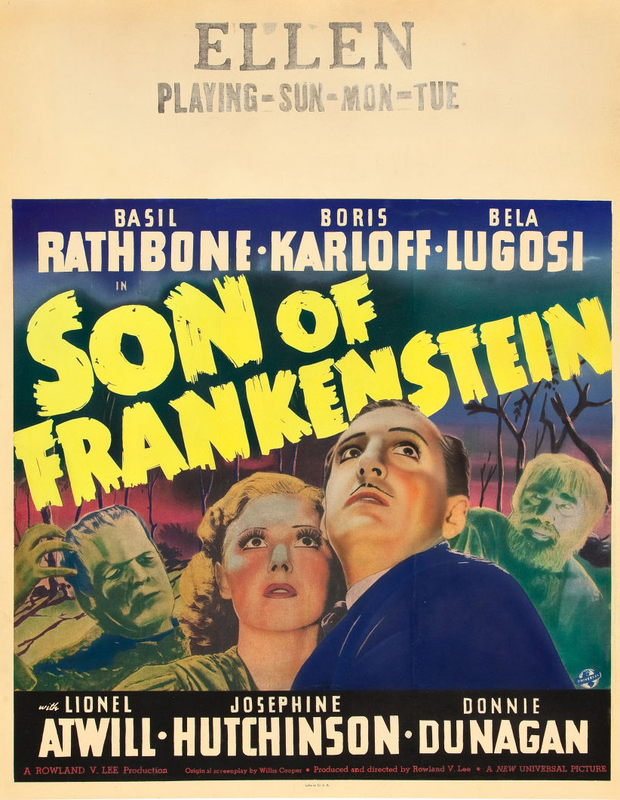 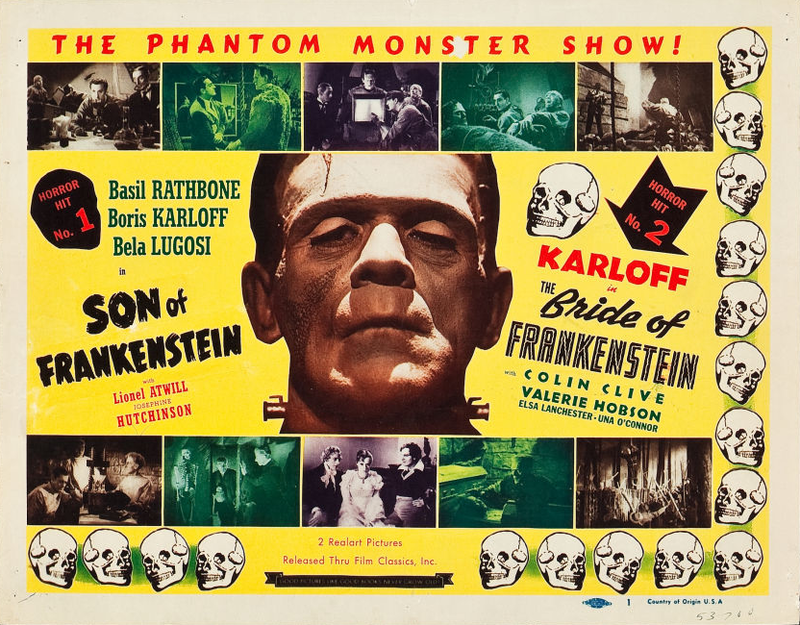 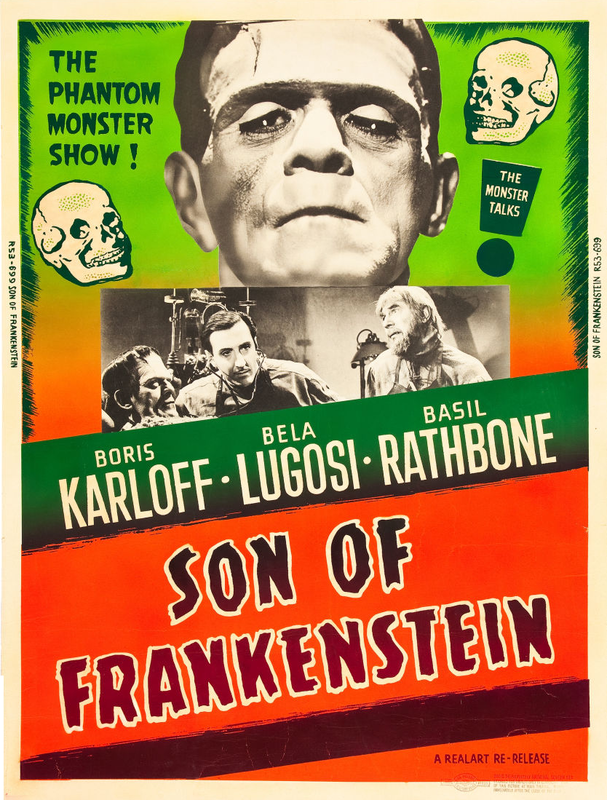 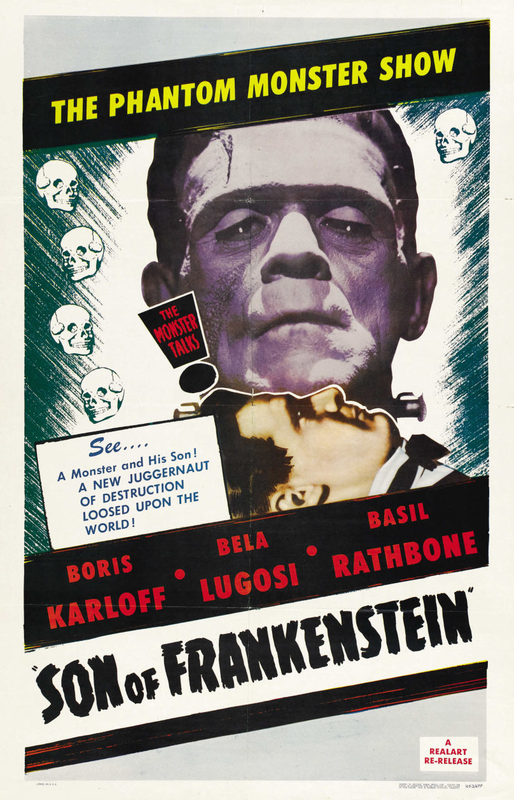 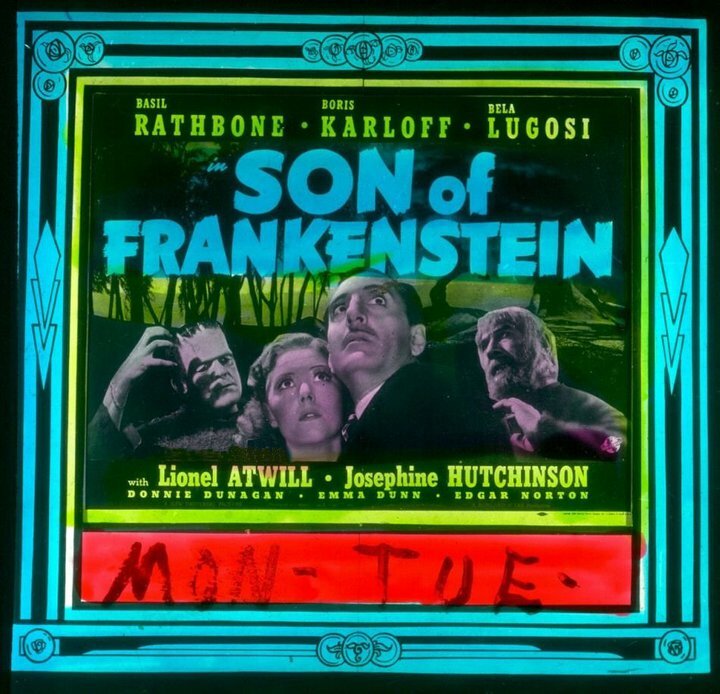 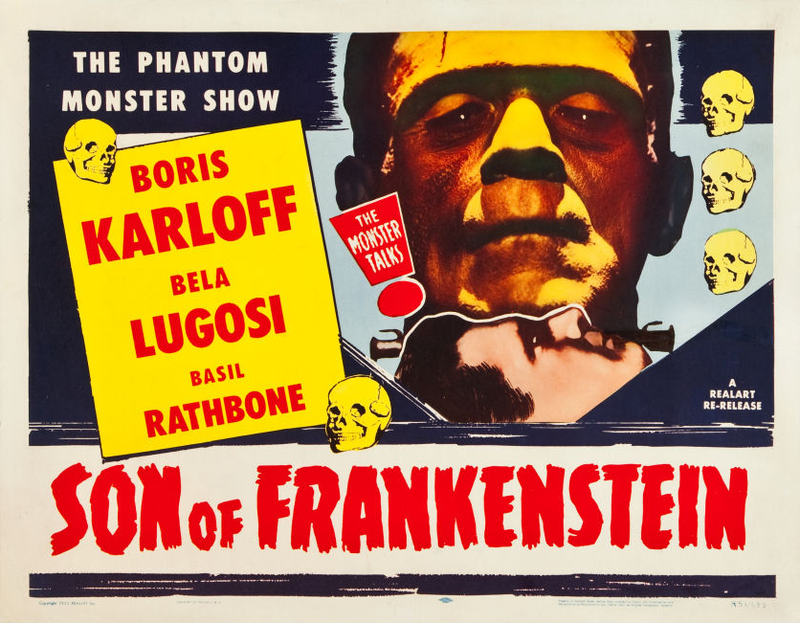 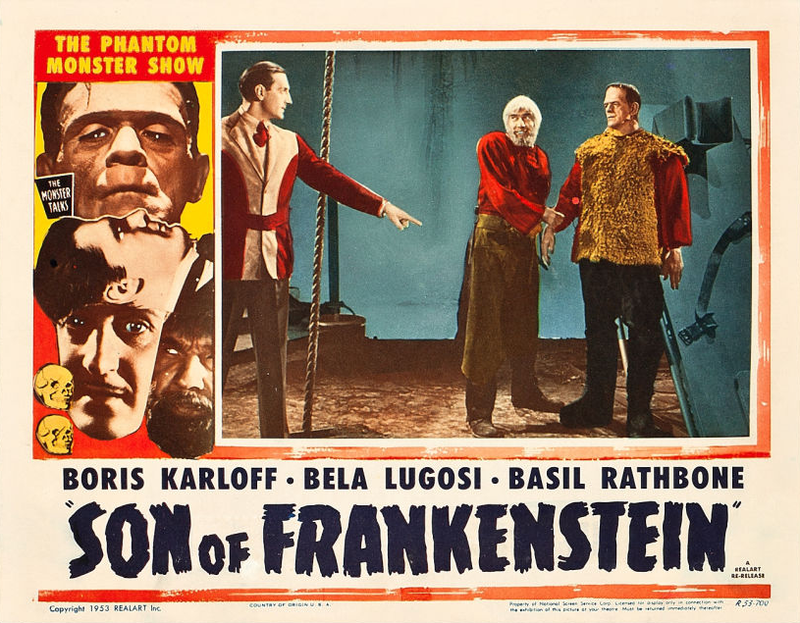 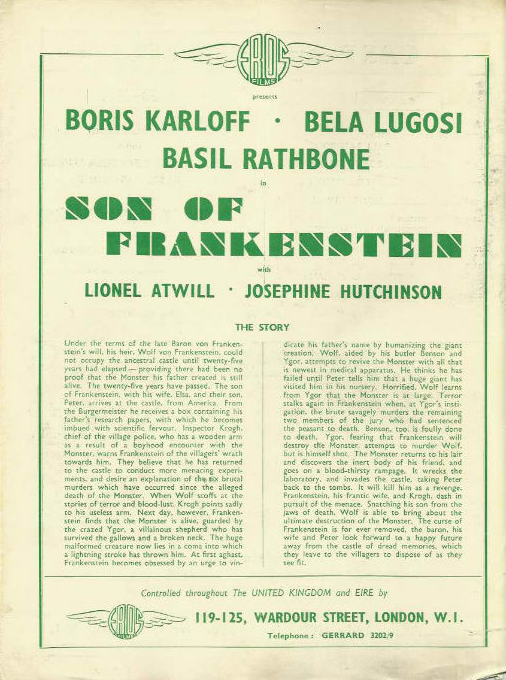 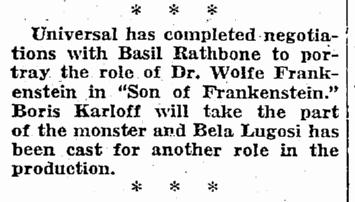 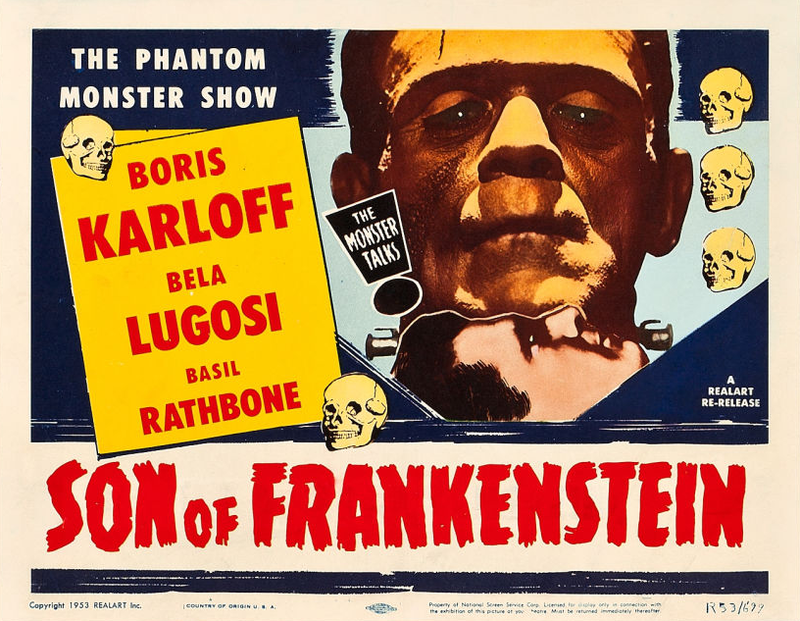 Hollywood – Universal is doubling the budget on “The Son of Frankenstein” with Basil Rathbone, Boris Karloff, Bela Lugosi, Lionel Atwill and Josephine Hutchinson, under the direction of Rowland V. Lee. 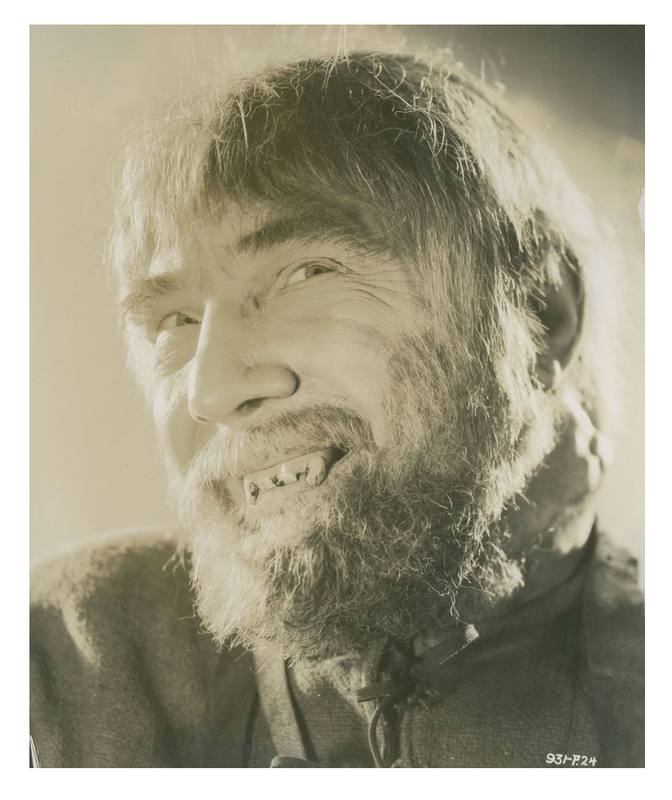 This means that more than $500,000 will be spent on this pix. 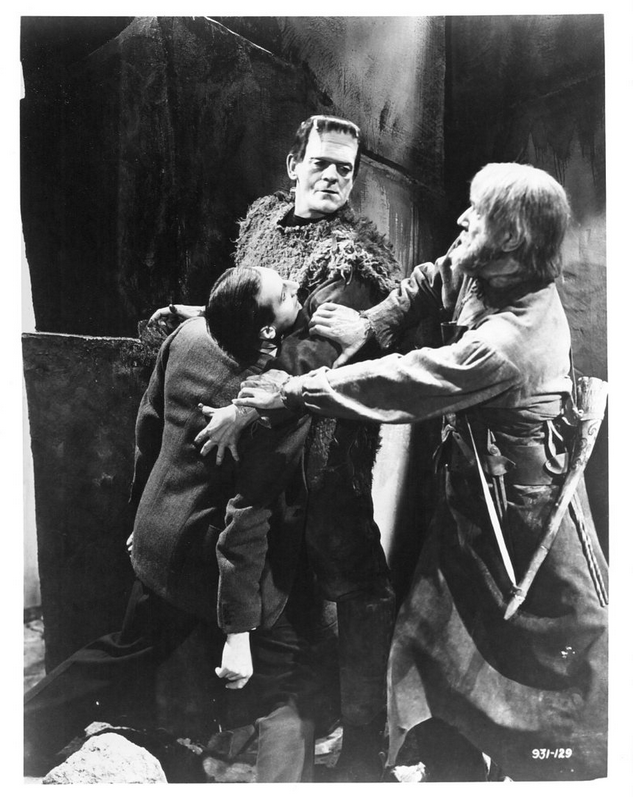 Boris Karloff’s man-made monster is revived in the castle of Frankenstein to provide material for another adventure of the ogre. 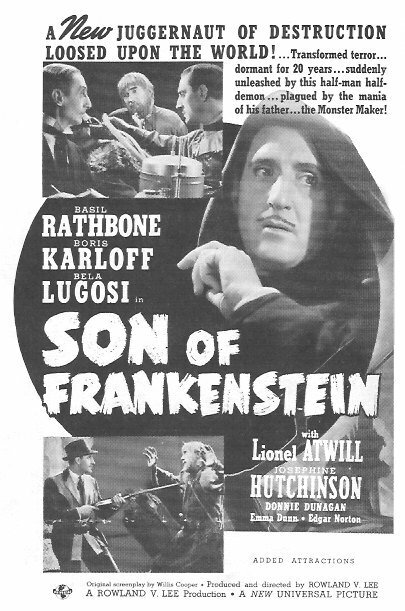 Basil Rathbone, son of the scientist-creator, returns from America to the family estate, becomes intrigued with the dormant ogre and revives him with idea of changing the brute nature within. 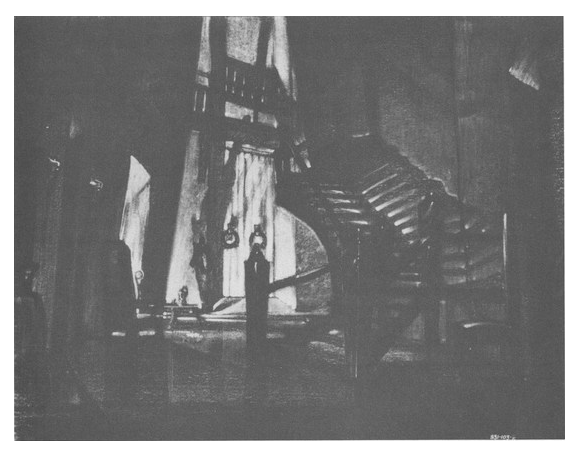 There are secret passages and panels; surprise opening of doors; and well-timed sound effects to further create tense interest. 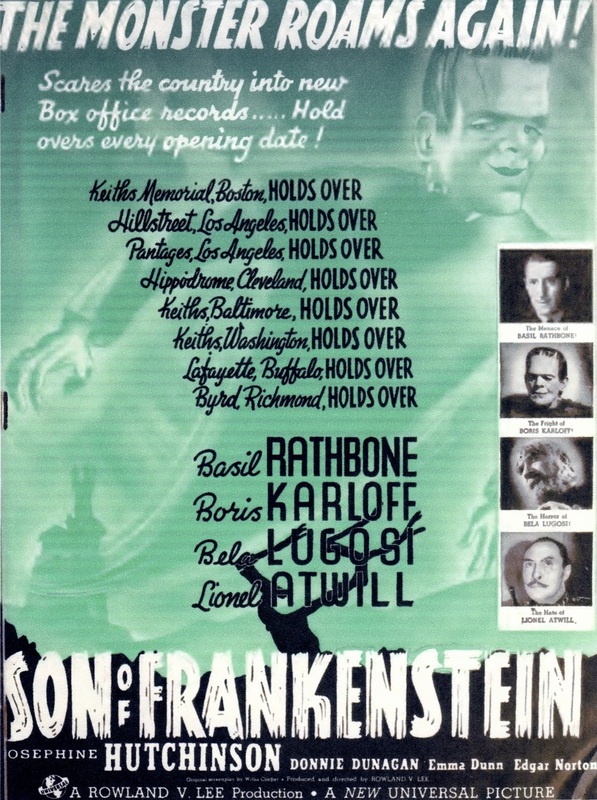 For offering of its type, picture is well mounted, nicely directed, and includes cast of capable artists. 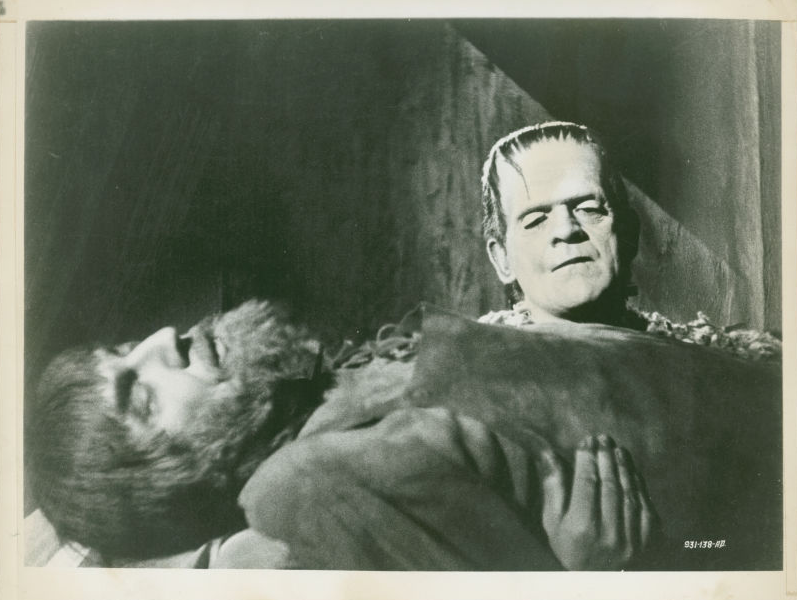 Karloff has his monster in former groove as the big and powerful brute who crushes and smashes victims. 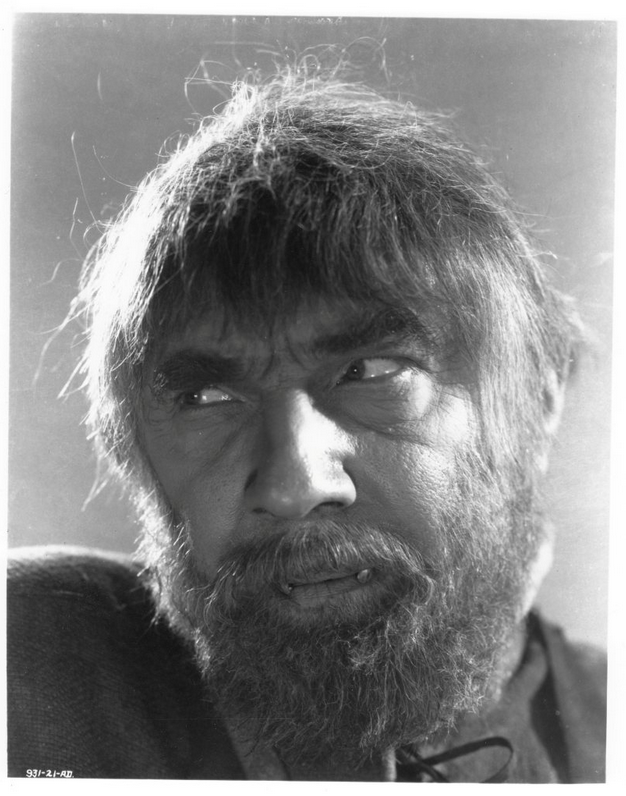 Bela Lugosi is the mad cripple who guides the monster on murder forays. 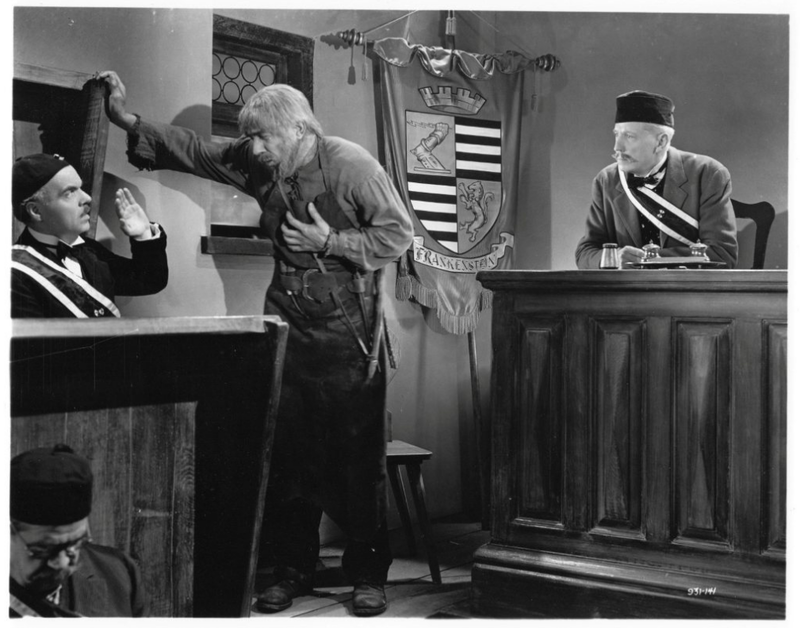 Lionel Atwill is prominent as village inspector of police. 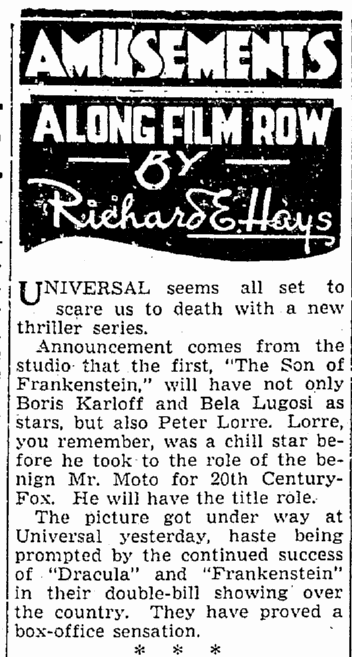 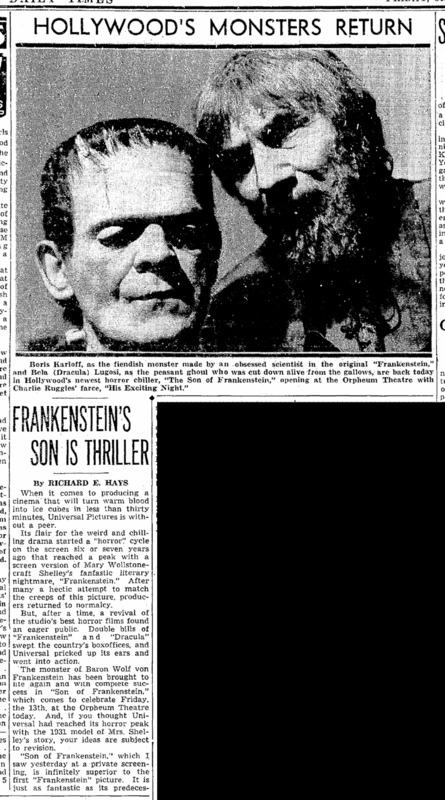 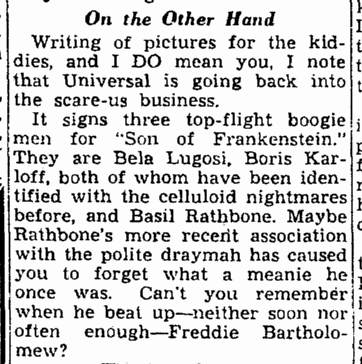 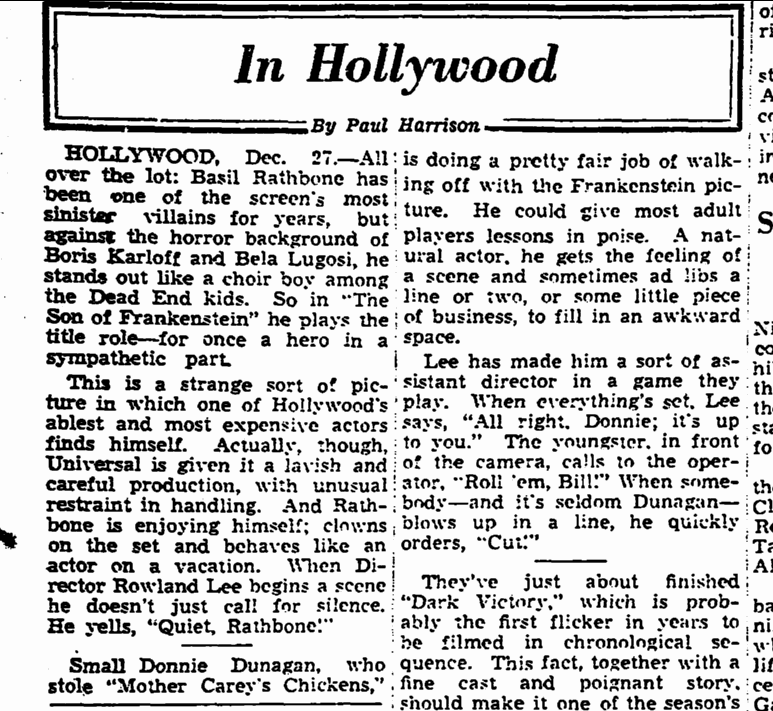 BORIS KARLOFF, the Frankenstein monster, will return to the screen shortly under the auspices of Universal Studios. 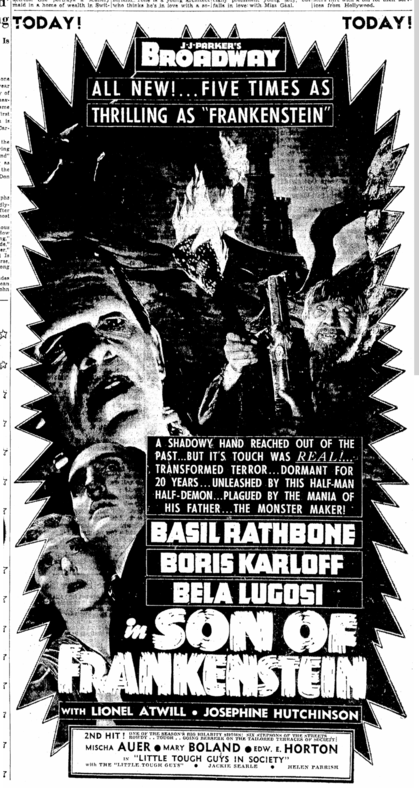 Aiding him in spine-chilling effects will be Bela Lugosi, associated formerly with newly-dug graves and vampires, and Basil Rathbone, sinister villain of many a cinema epic. 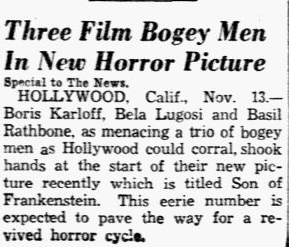 Does the public want more of “The” Horror Boys/’ as they are affectionately called? 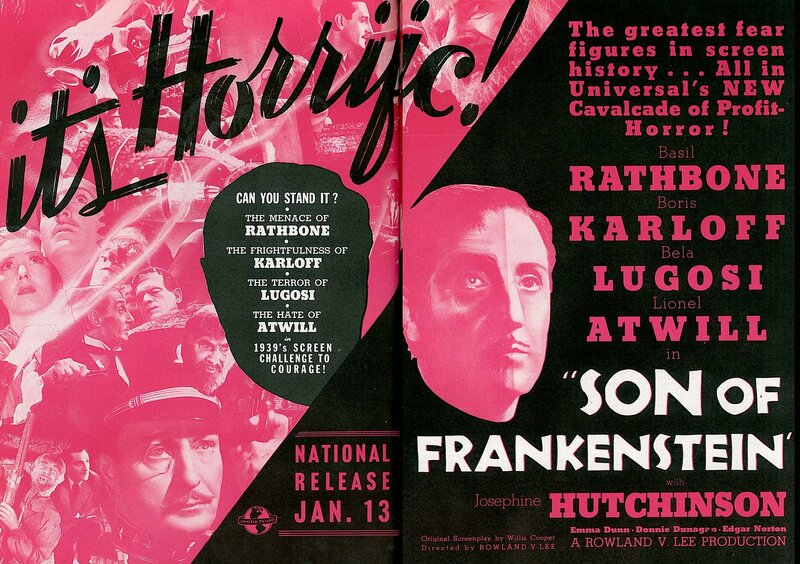 A recent survey showed that audiences, particularly young audiences, arc clamoring for them. 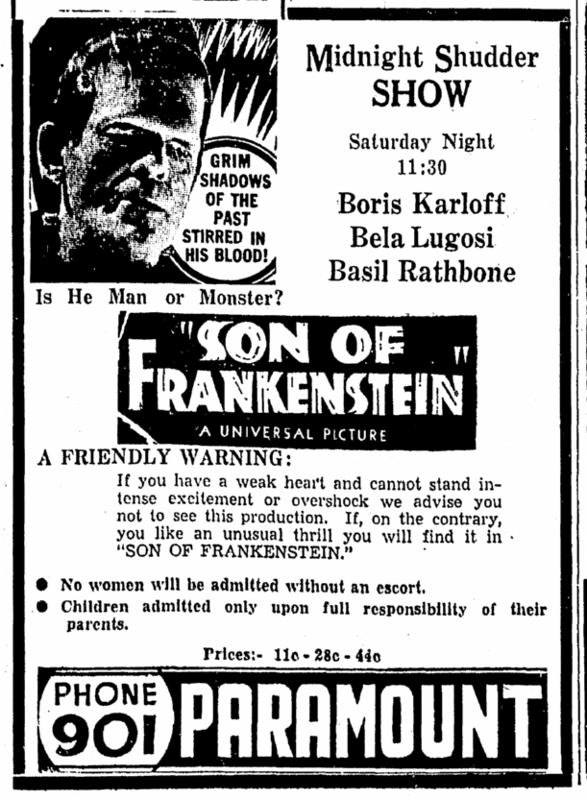 Before starting “The Son of Frankenstein,” Universal decided to reissue some of the old thrillers to check up on audience reactions. 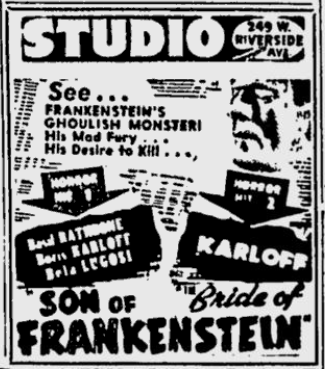 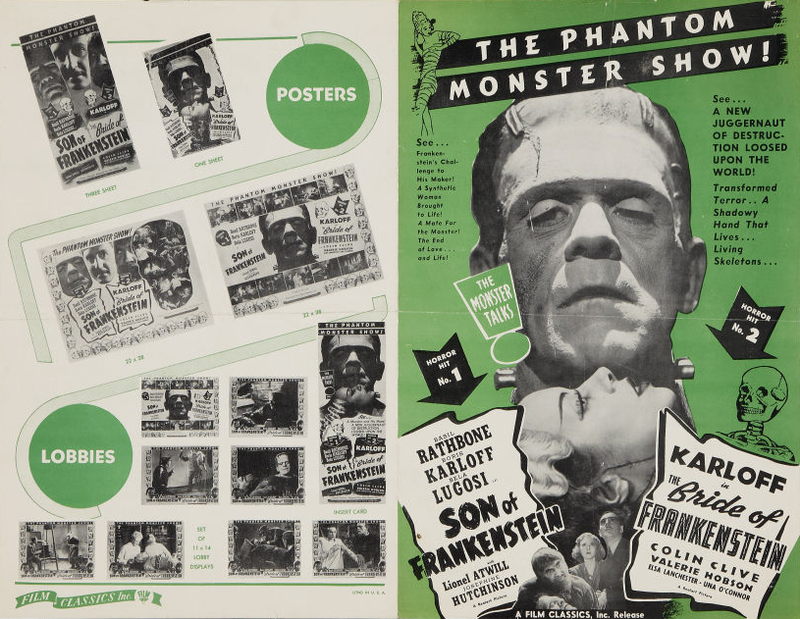 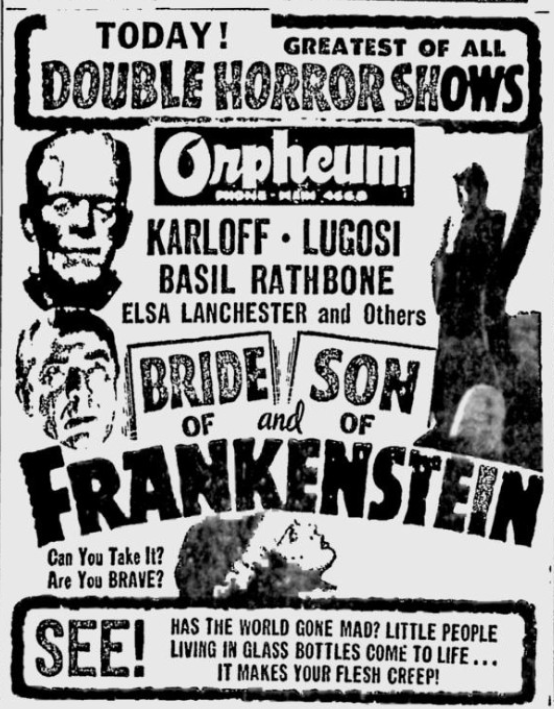 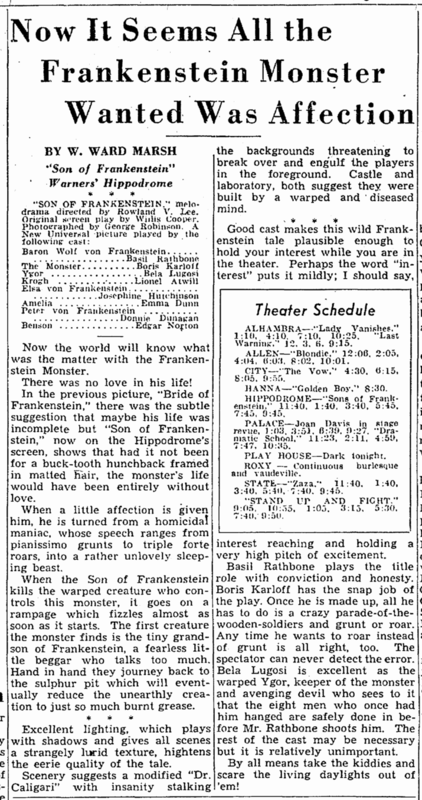 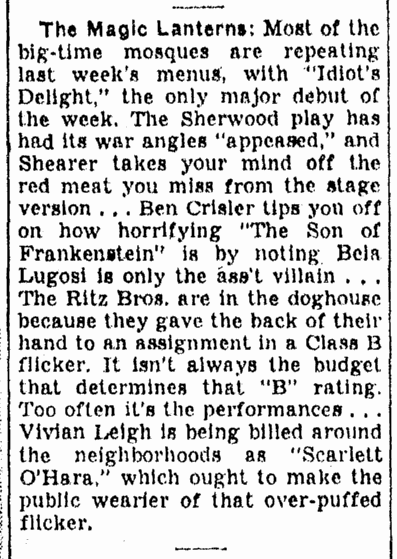 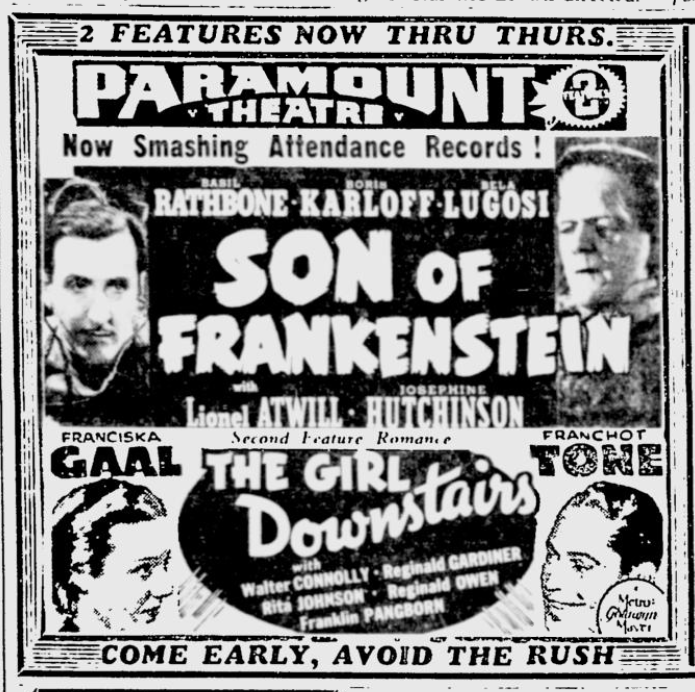 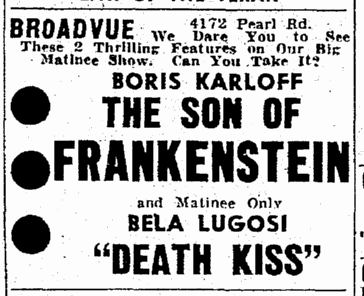 Neighborhood theatres showed a triple bill that week, “Fran kenstein,” “The Vampire,” and “The Bride of Frankenstein.” to capacity houses. 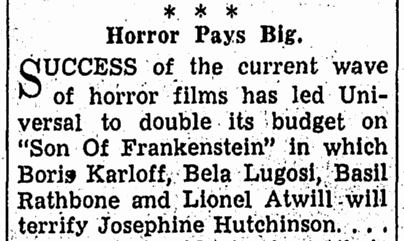 This thoroughly satisfied them that if the public will go crazy over the “Horror Boys” in three different films, they will certainly pay their pennies to the box-office for the colossal spectacle of the boys together in one film. 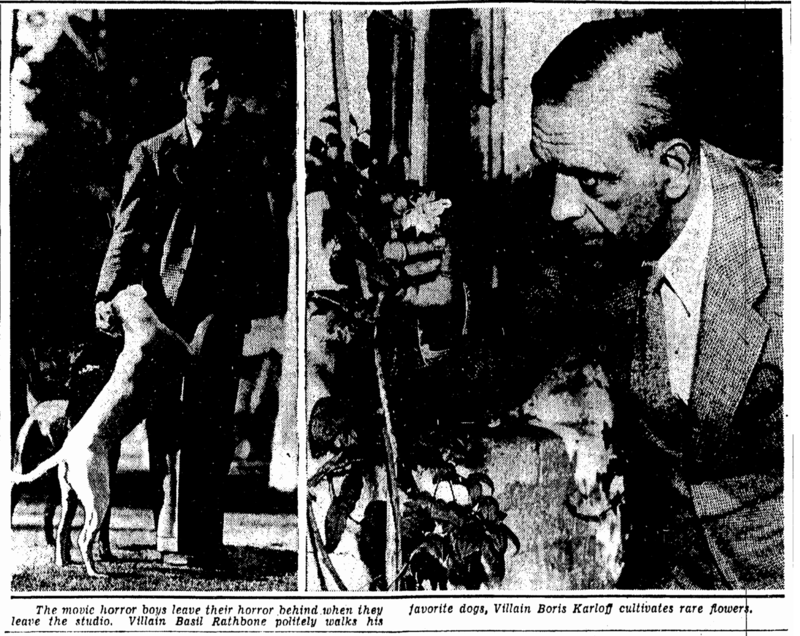 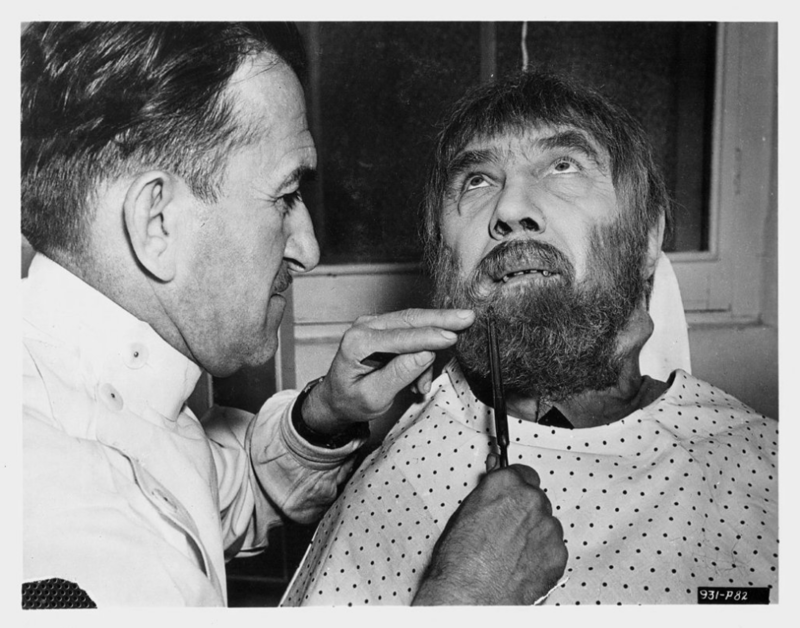 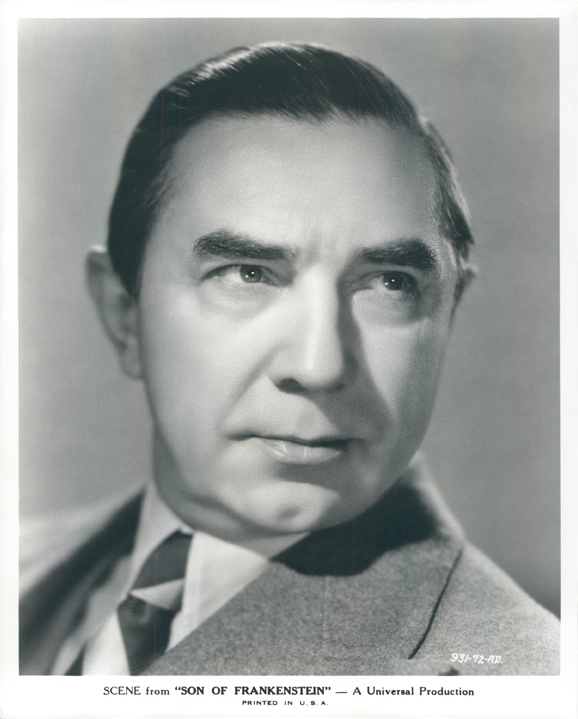 It was Bela Lugosi, Hungarian actor, who gave me a few facts of the filming of the latest hair-raiser. 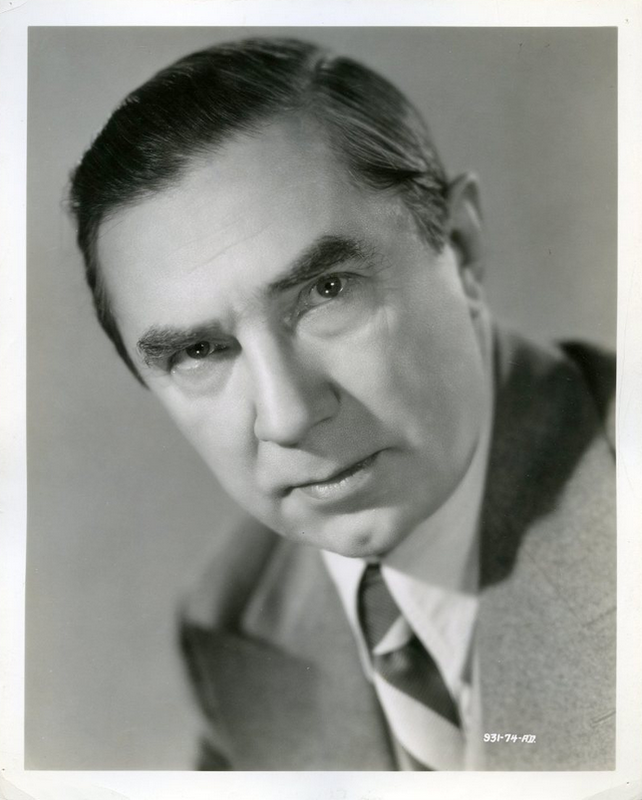 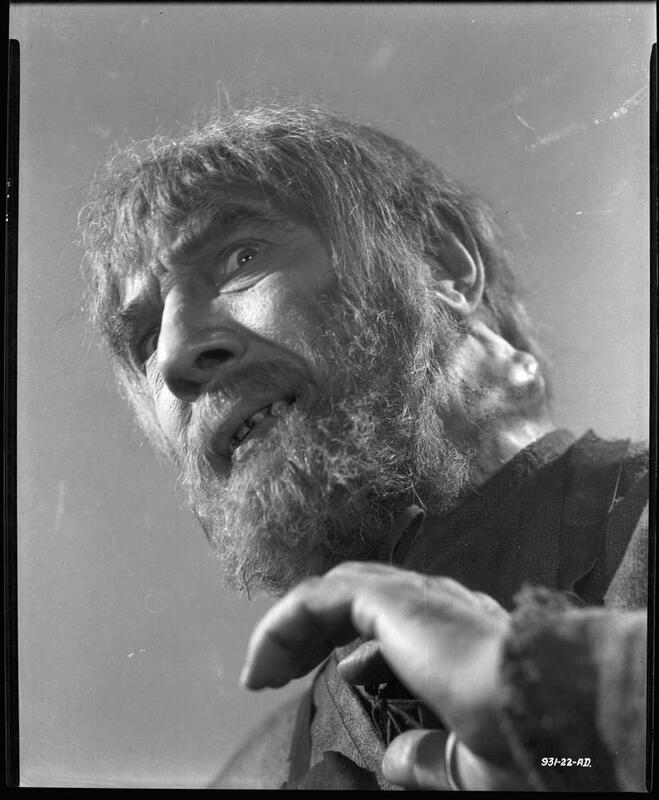 Mr. Lugosi looked properly repulsive going through all his scenes with his head on one side. 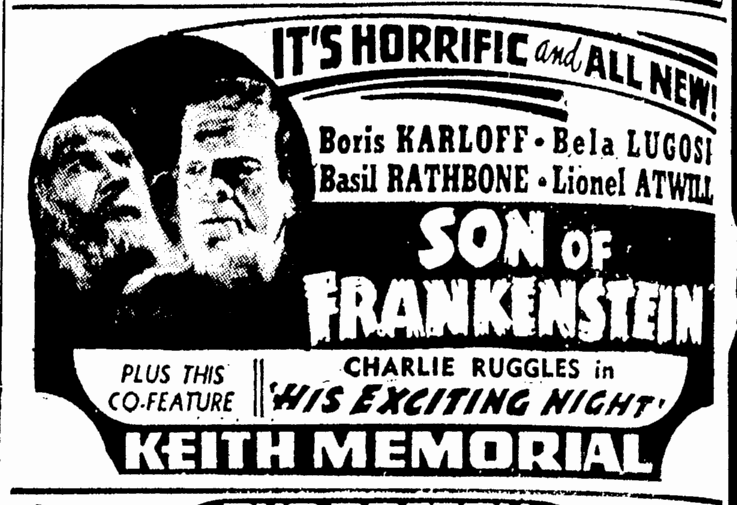 “But where does Boris Karloff come In?” I asked. 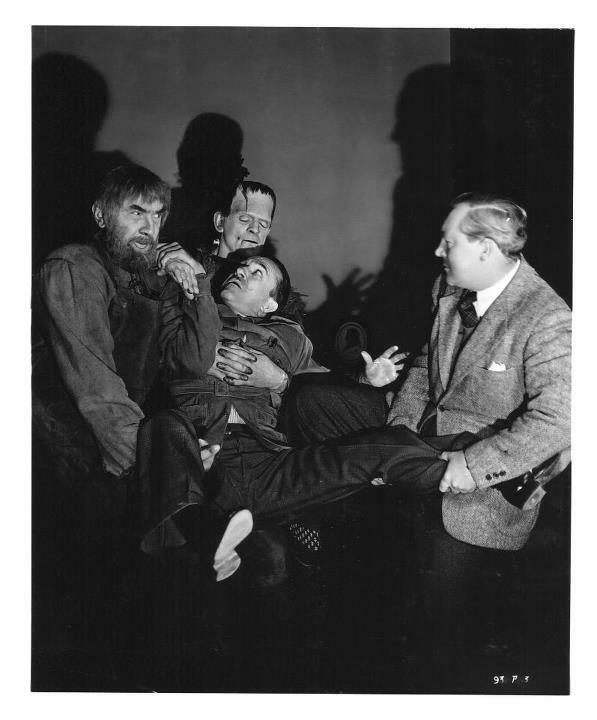 “Ah, I discover him,” continued Mr. Lugosi, trying to get the stiffness out of his neck. 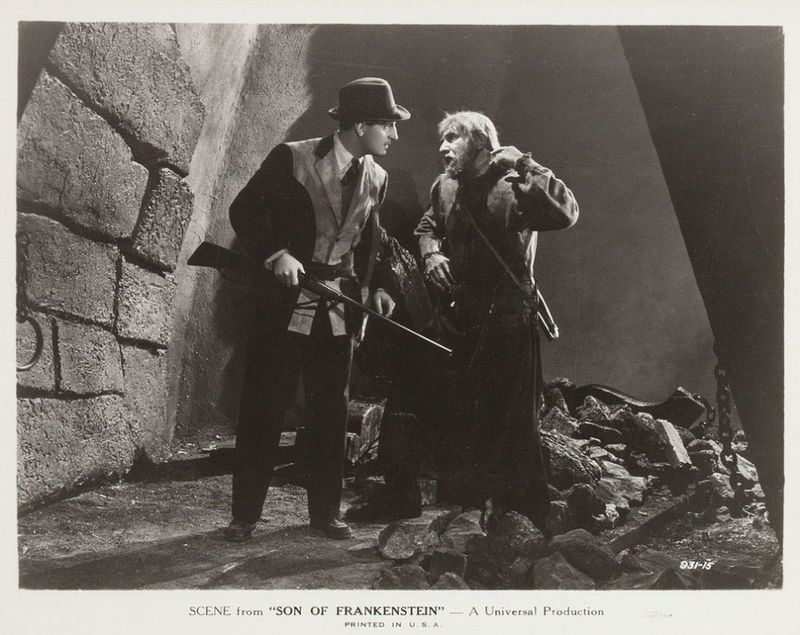 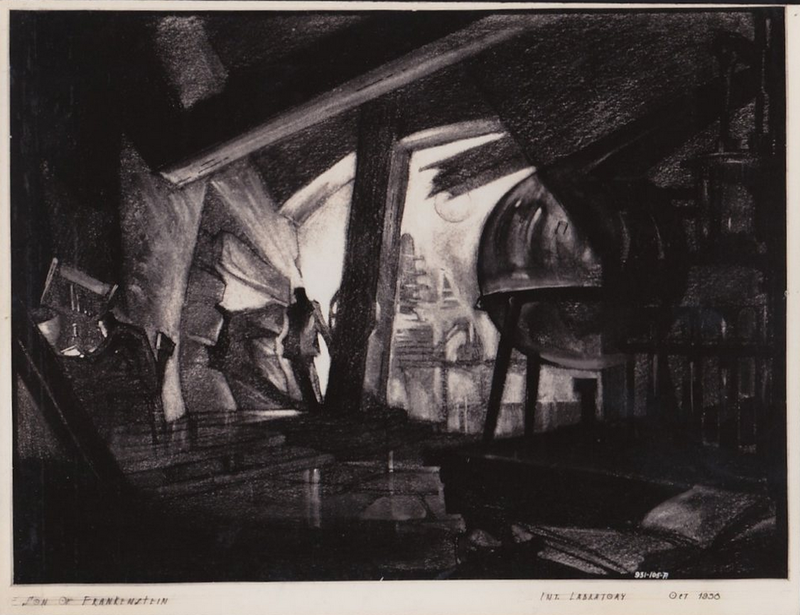 “In the last Frankenstein picture, the laboratory blew up, killing Frankenstein, but not the monster who was left suspended midway between this life and the next by a mysterious cosmic ray. 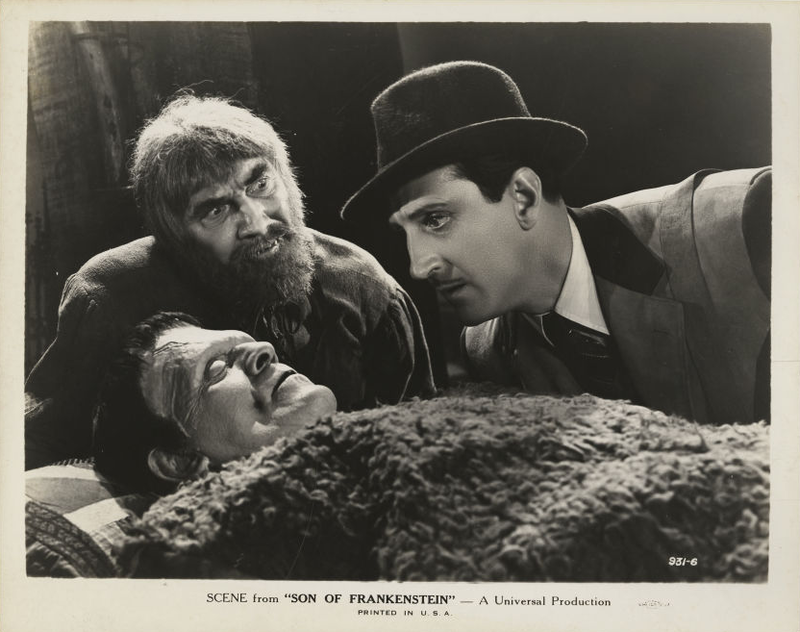 I find him and Rathbone brings him back to life. 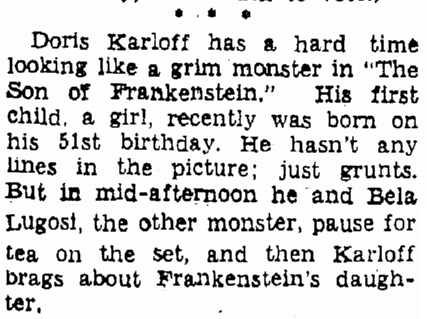 Karloff isn’t working today. 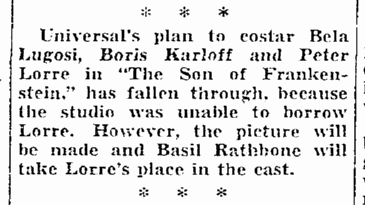 The studio tries to give him as much time off as possible, as his part is so wearying on him. 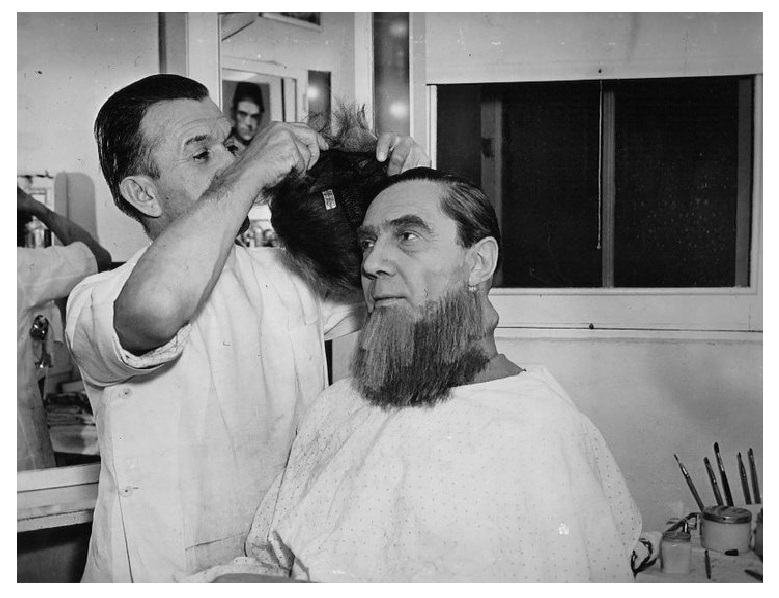 Did you know that his make-up takes three hours to apply, and one hour to Temove? 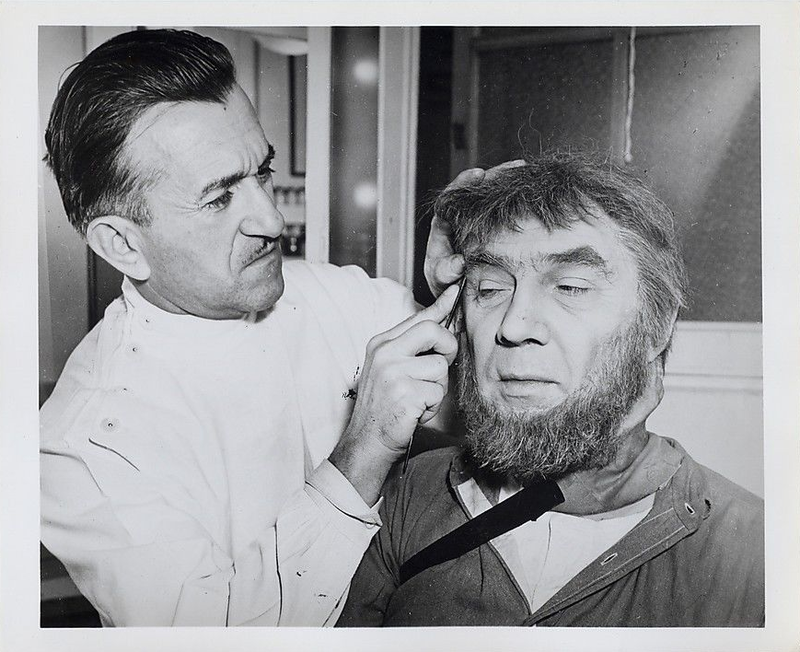 Speaking of make-up, let me tell you a story in connection with this picture. 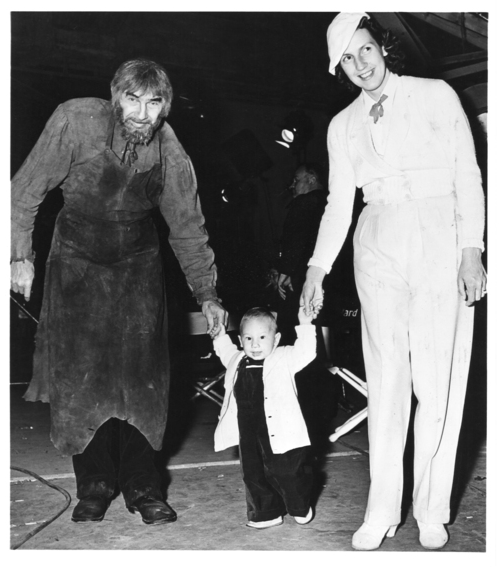 “Our producer got the idea in a dream one night of filming us in technicolor. 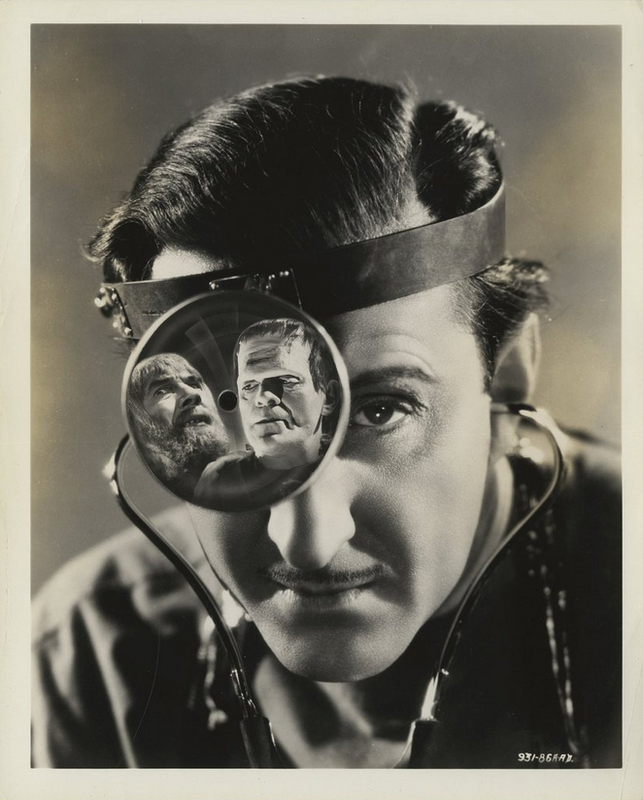 He was so excited at this thought that had not occurred to anybody else, that he ordered tests to be made immediately of our ghoulish make-up. 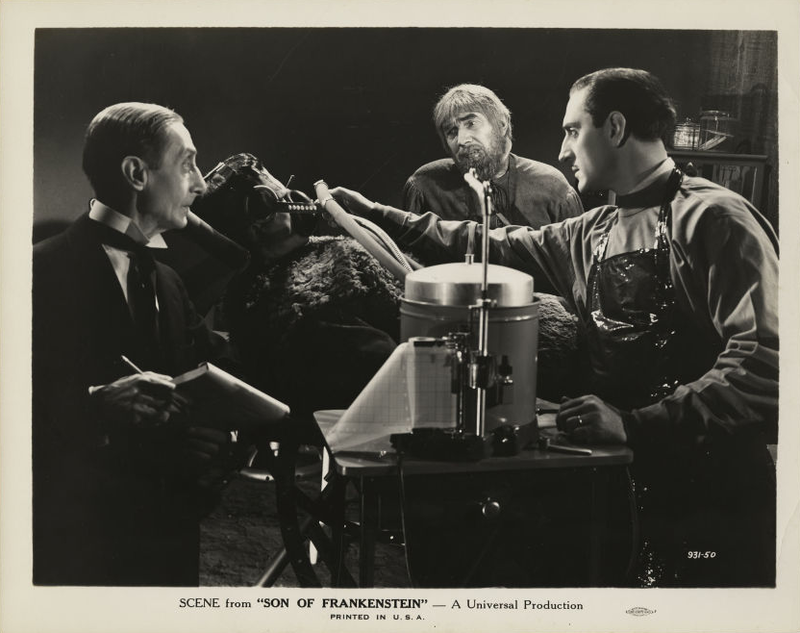 “Some days later the tests were ready and the producer and his associates hied themselves to the projection room to look us over. 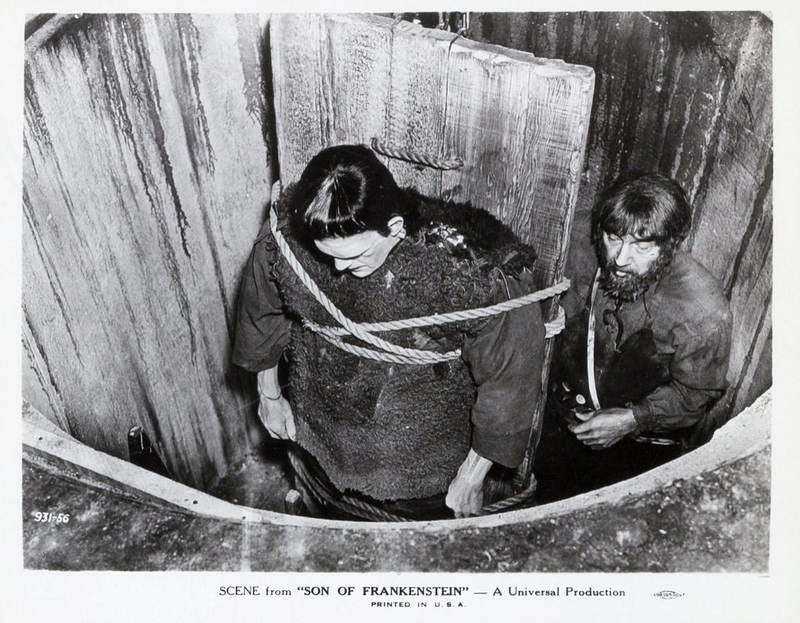 They never saw the tests through, though, for the minute Boris Karloff came on the screen even the hardened producer was ready to drop with fright and disgust. 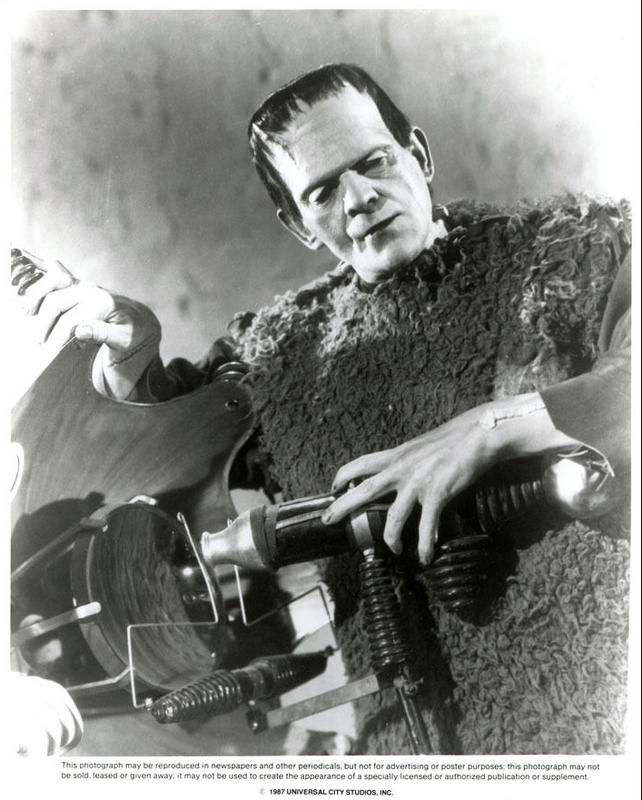 He lost no time in stopping the machine that flashed that evil face dripping with gangrenous hues on to the screen. 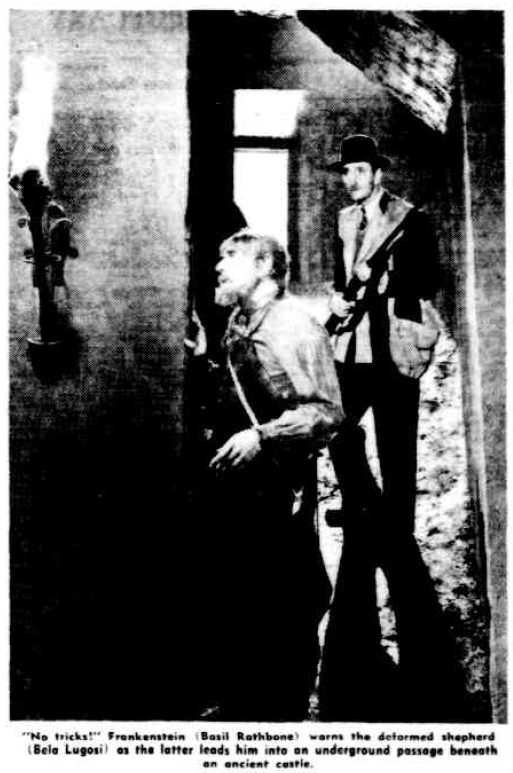 “Stop!” he yelled. 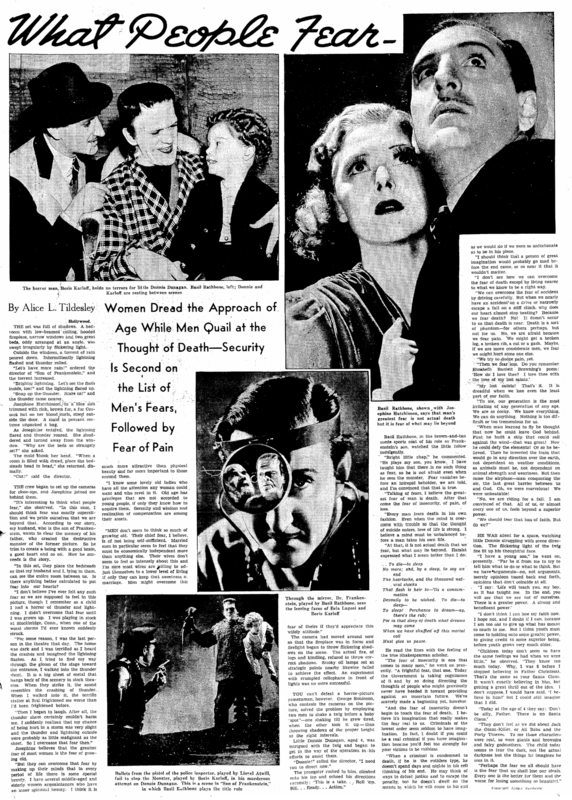 “It is much too horrible. 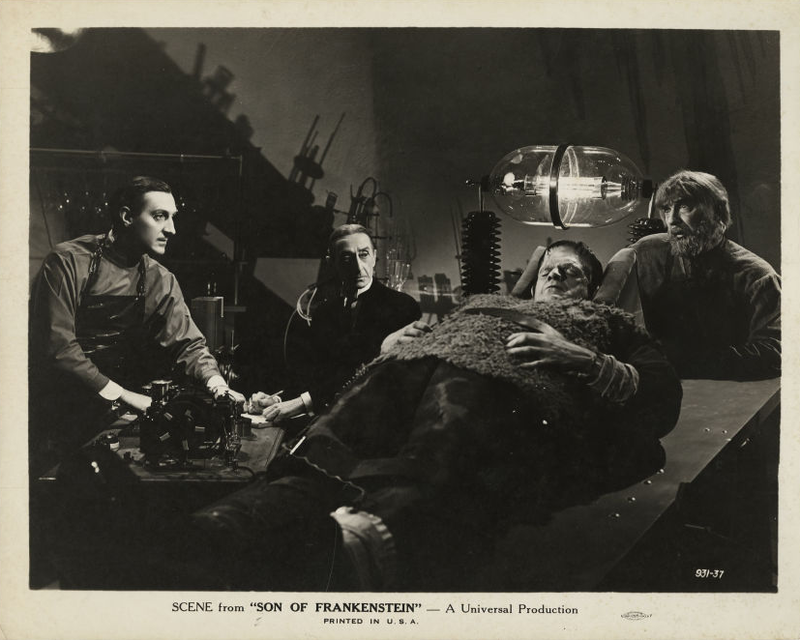 Stop It!” “The Son of Frankenstein” will not be filmed in color, for although every known device is being used to promote eeriness and horror, the natural medium of color has been pronounced much too realistic and violent in its impact. 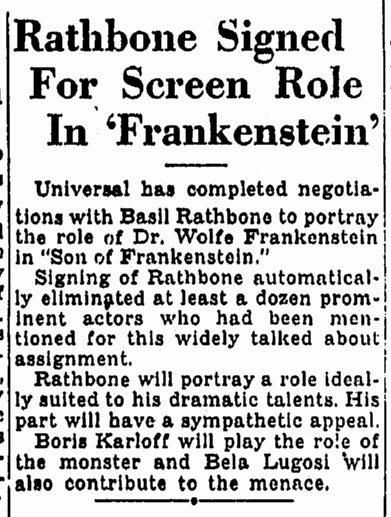 Basil Rathbone and Boris Karloff are both Englishmen who made their first successes on the London stage. 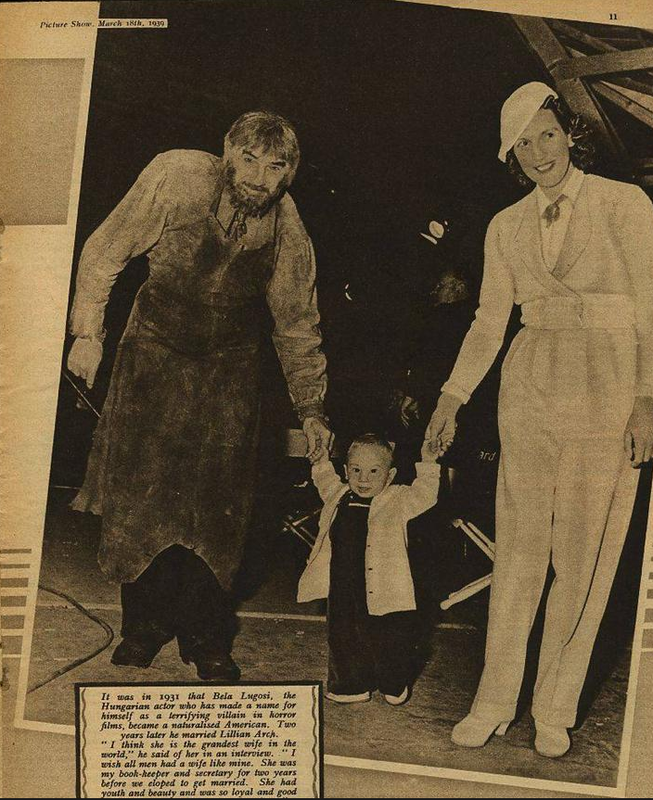 Since we saw him last Boris (who is gentle and mild-mannered off the screen and whose favorite occupation is cricket) has made a picture in England, and also one for Warner Brothers entitled “Devil’s Island.” He seems to play unwholesome parts and to wear pounds of heavy make-up, but he is very philosophical about his reputation as the finest baby-frightener in the world. 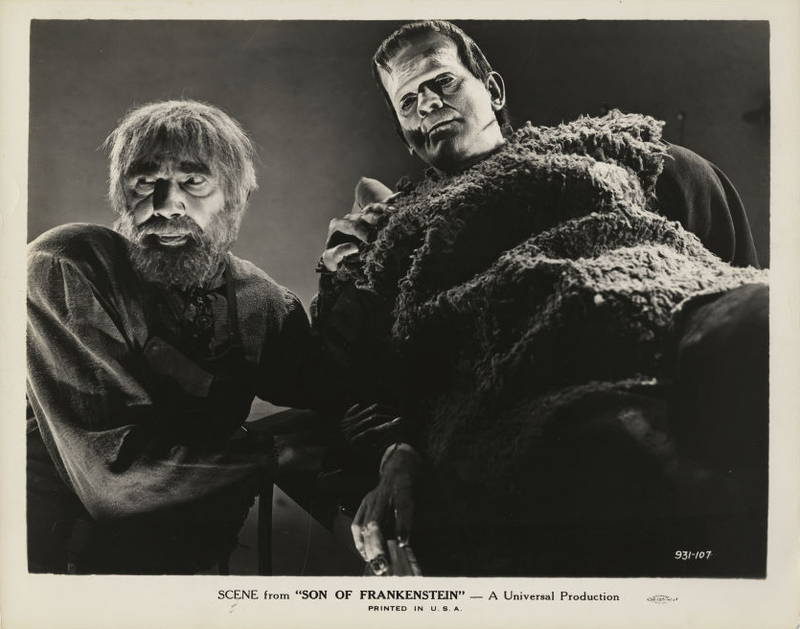 Half a million dollars has been set aside as a budget for the “Horror Boys” and the studio hopes to reap many times this amount in box-office returns when “The Son of Frankenstein” is released. 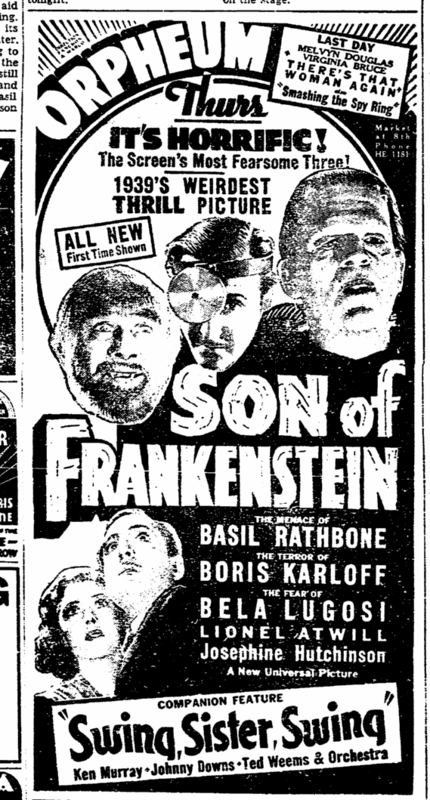 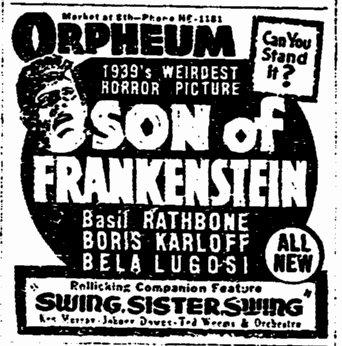 No use beating around the razzberry bush: if Universal’s “Son of Frankenstein,” at the Rivoli, isn’t the silliest picture ever made, it’s a sequel to the silliest picture ever made, which is even sillier. 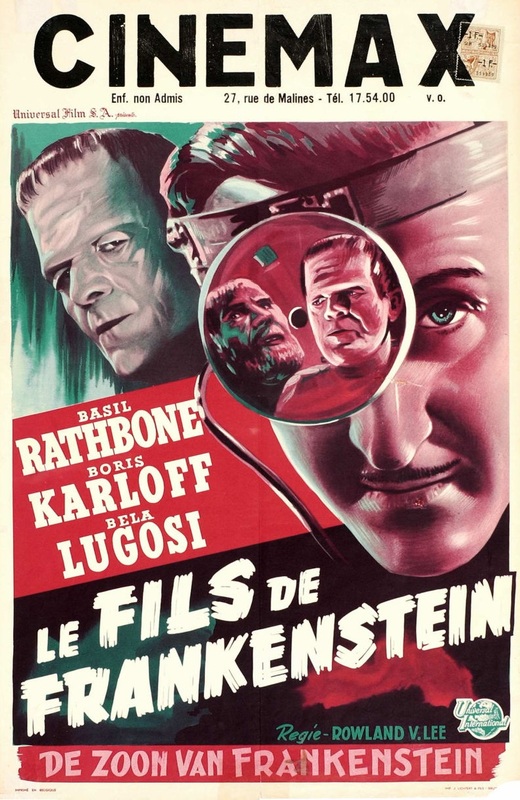 But its silliness is deliberate-a very shrewd silliness, perpetrated by a good director in the best traditions of cinematic horror, so that even while you laugh at its nonsense you may be struck with the notion that perhaps that’s as good a way of enjoying oneself at a movie as any. 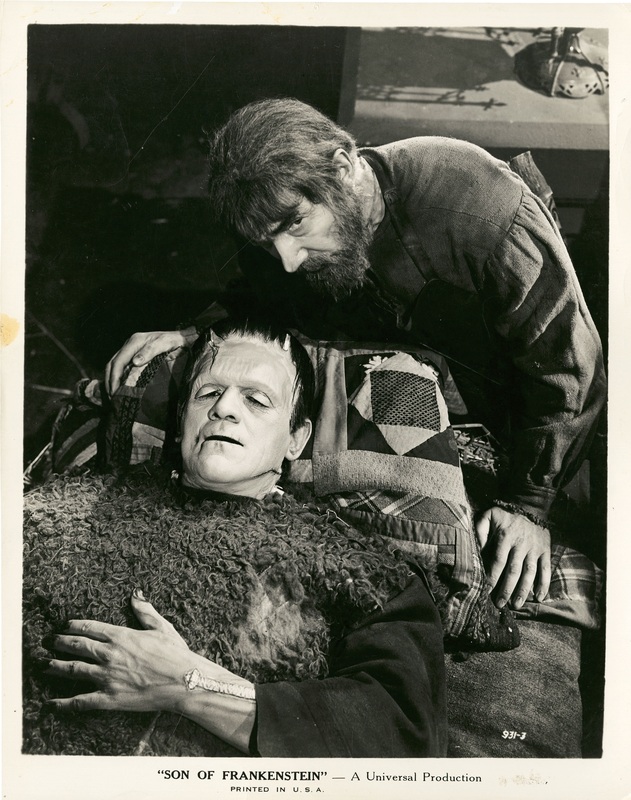 It must have been all the actors themselves could do, in this day and age, to keep straight faces-always excepting poor Boris Karloff, of course, who couldn’t laugh through all that make-up even if he tried. 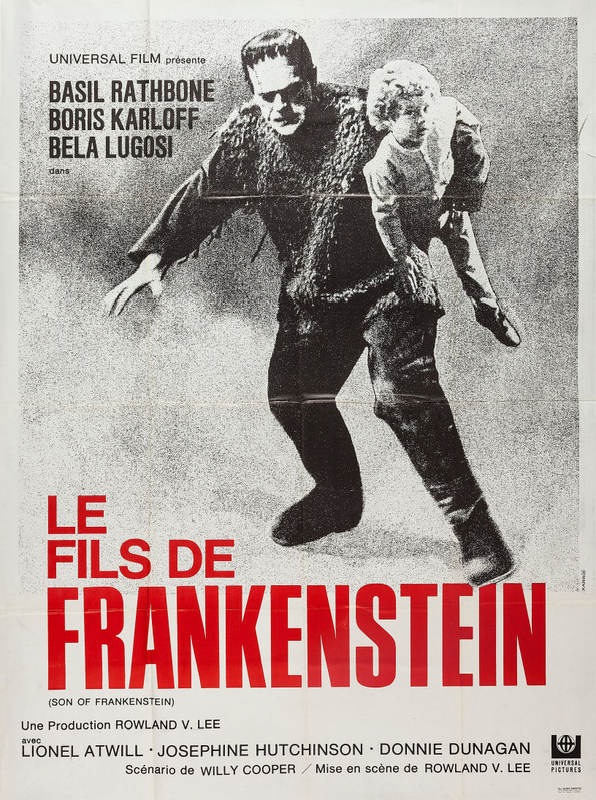 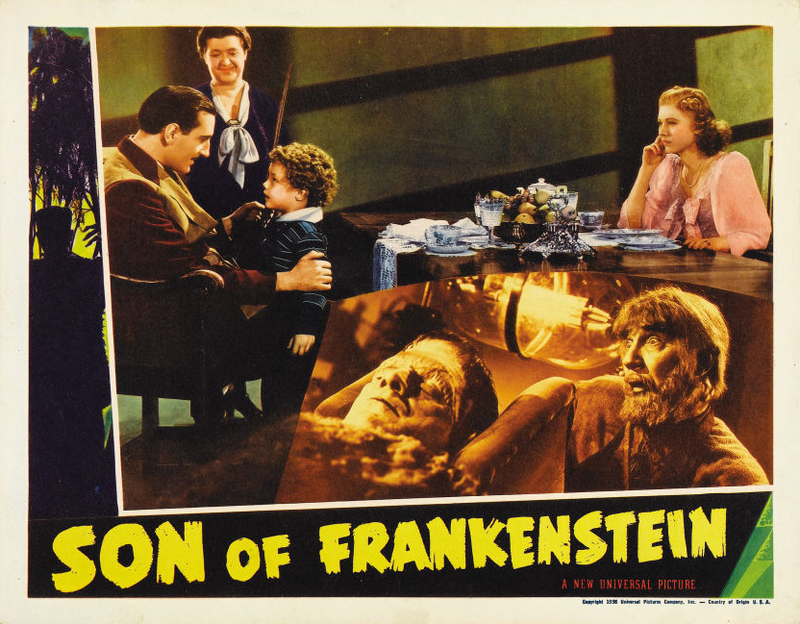 For “Son of Frankenstein” is a chip off the old Doc, the most horrible horror picture you ever saw-at least since “The Bride of Frankenstein” (which was a sequel to “Frankenstein”). 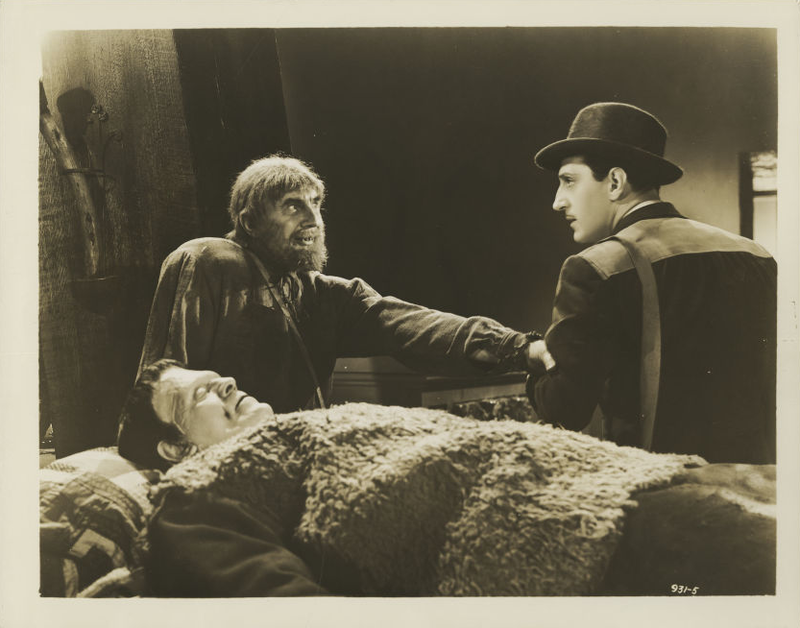 Imagine, if you can, a picture so tough that Basil Rathbone plays a sympathetic part in it, so mean you feel sorry for Lionel Atwill, so ghastly that Bela Lugosi is only an assistant bogyman. 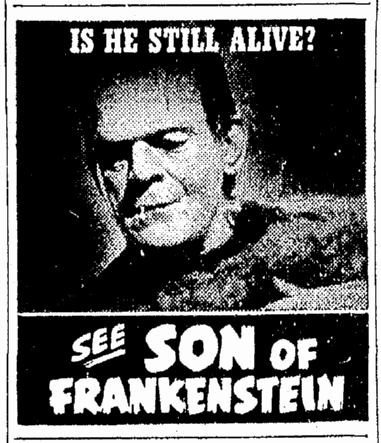 If you can imagine all this, then it is possible that you may have a pale, partial conception of Frankenstein, fils. 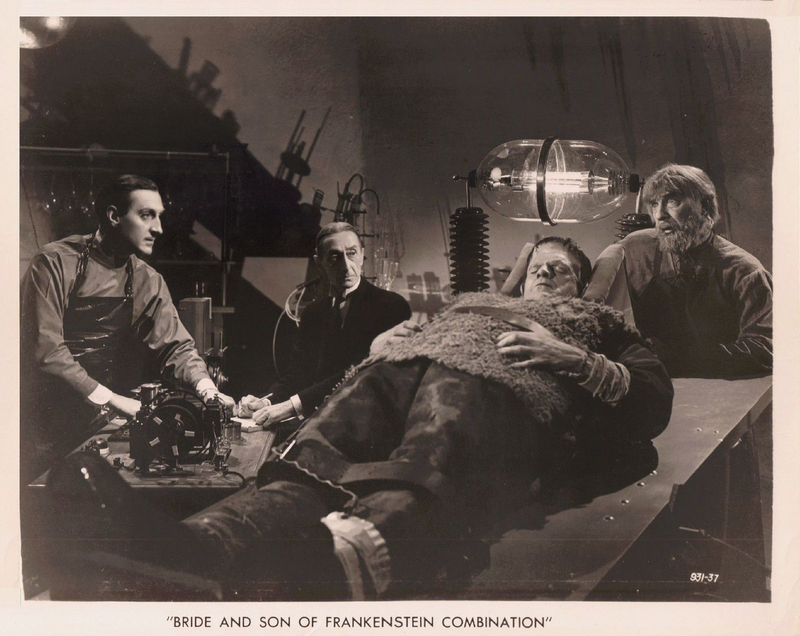 It is such a picture that-if Mary Wollstonecraft Shelley had suspected the mere possibility of it-she might have consigned that first mild manuscript to the flames, in sheer diffidence. 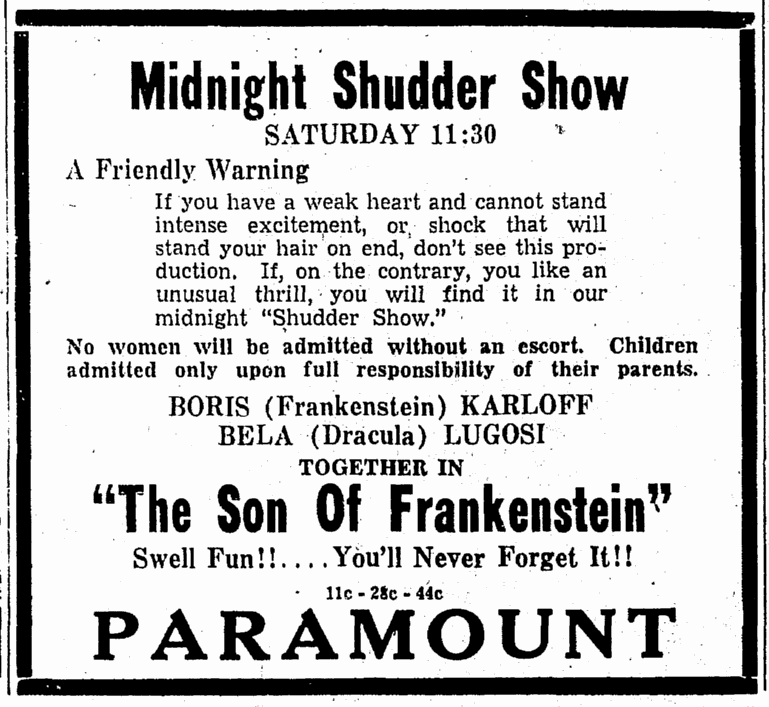 For our part, we’re rather glad she didin’t. 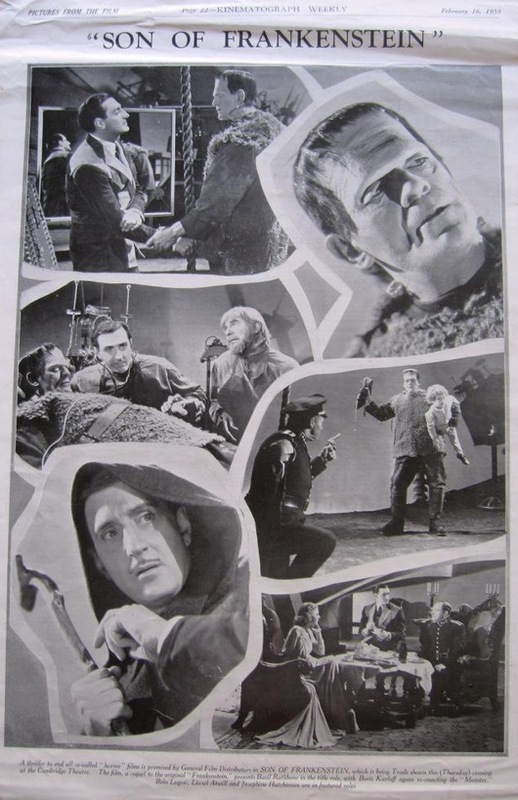 Anybody who’d like a nice, unsunny place to be haunted in couldn’t do worse than rent Castle Frankenstein for the season. 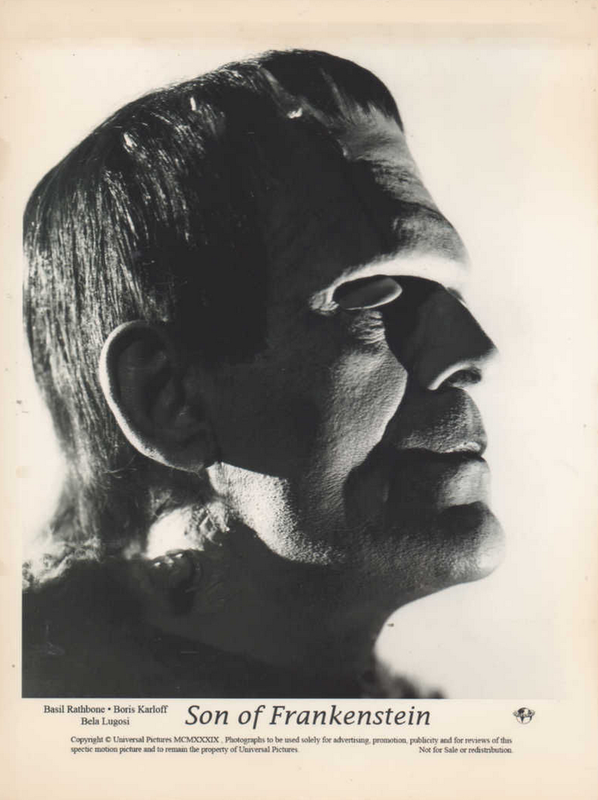 Such a paradise of low, brow-bursting beams! 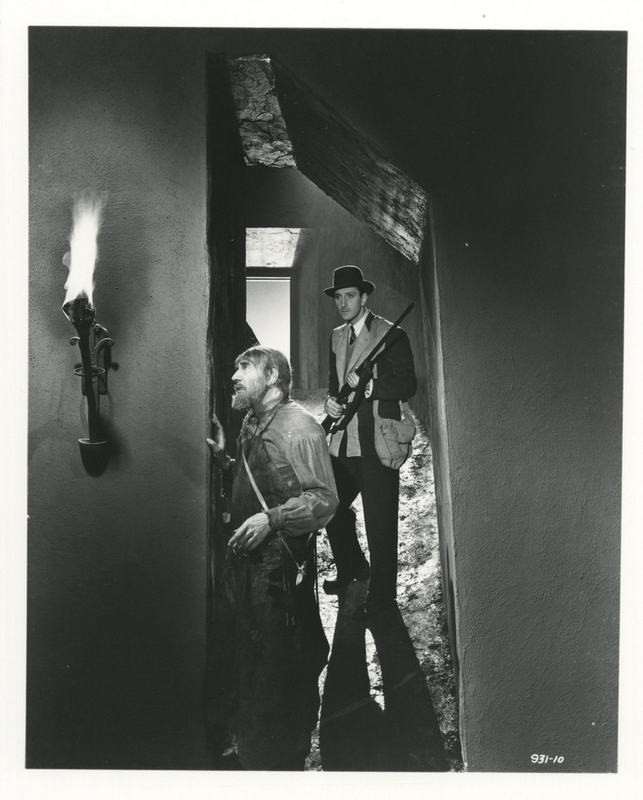 Such a number of enchanting secret doors and passageways! 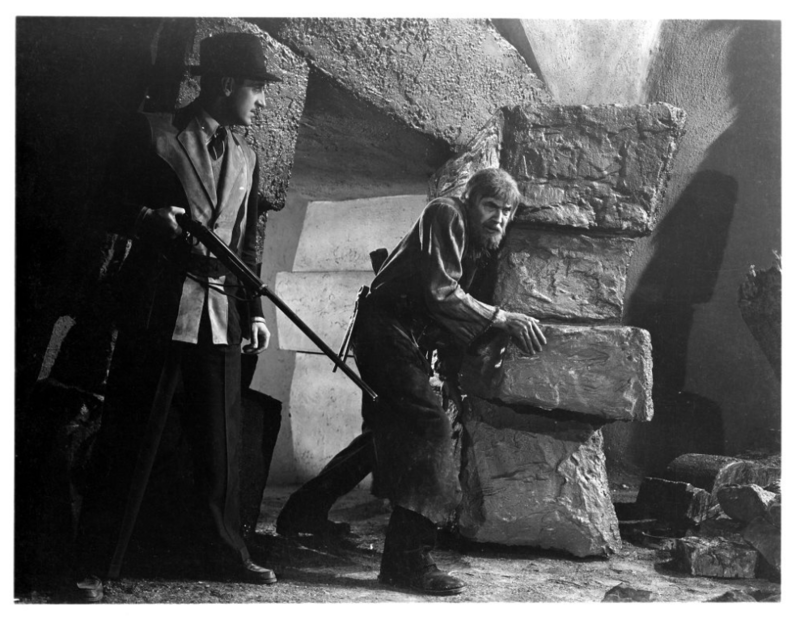 Such endless miles of corridors rendered fascinating by skiddy turns, pneumoniac draughts and sudden, breakneck stairways! 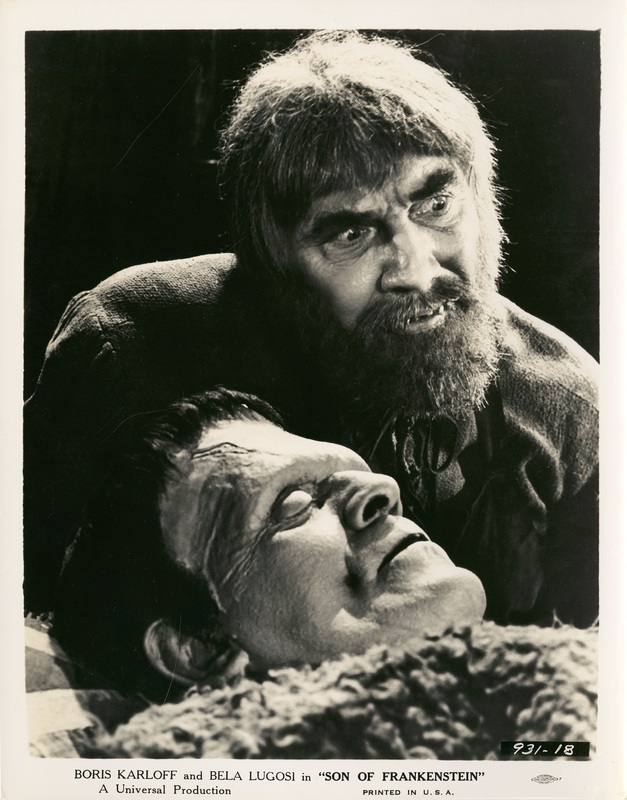 Such lovely views of the countryside, which combines the picturesque features of the Bad Lands of South Dakota with the rustic charm of the brimstone beds in and around Vesuvius. 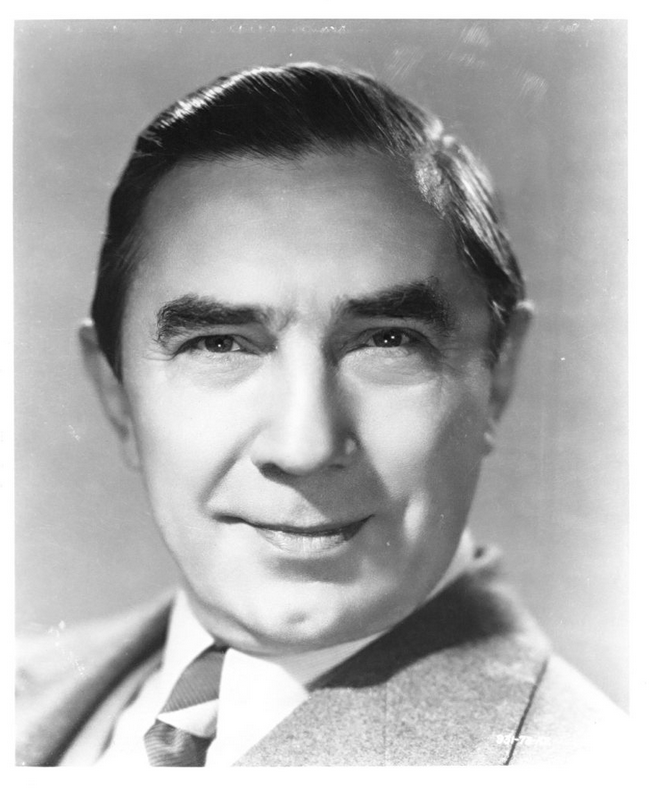 With a pit of boiling sulphur in the basement and Bela Lugosi living there as a combination monster-nurse and janitor, what could be cozier? 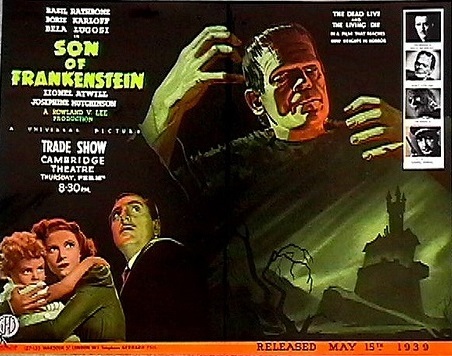 Yes, sir, Castle Frankenstein is the showplace of the neighborhood. 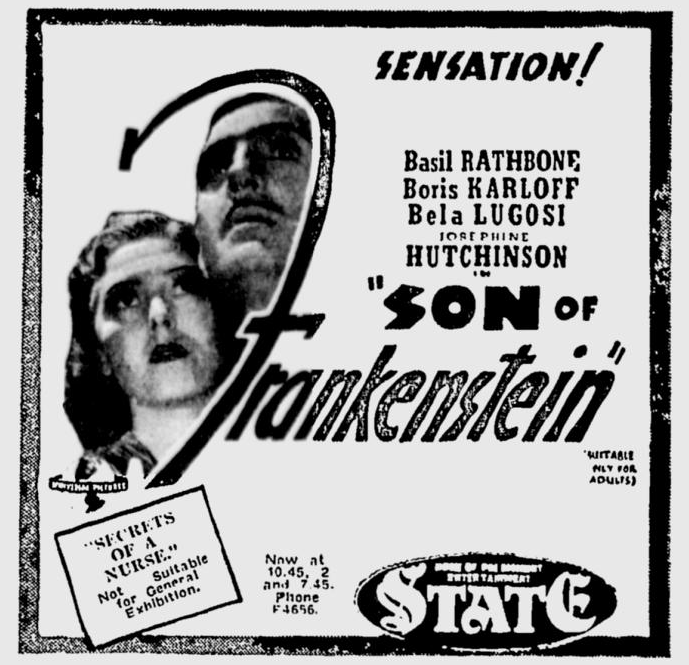 At dinner in the great hall Josephine Hutchinson seems justified in remarking to Basil that the front-door knocker “gets on her nerves,” inasmuch as each stroke is equivalent to the Independence Day explosion in San Francisco. 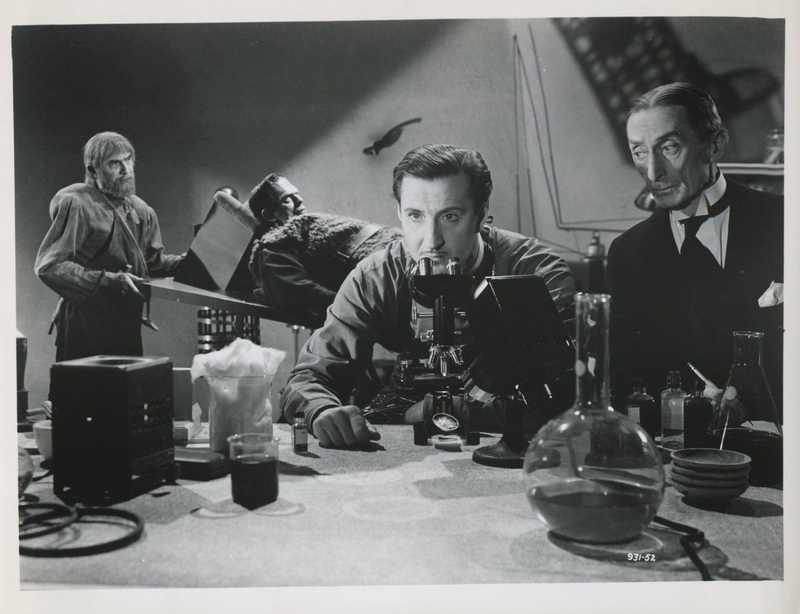 When the butler fails to show up and Mr. Rathbone (who thinks he has got the monster safely hidden out in the “lab,” as he calls it, of all things) inquires about him, the second man matter-of-factly explains: “He took a tray to the baby in the nursery, sir, and we haven’t seen him since.” No, by George, you couldn’t beat Castle Frankenstein for the purposes you have in mind-as a place to be haunted in, that is-and it certainly ought to be available cheap, considering what happened to the last tenants. 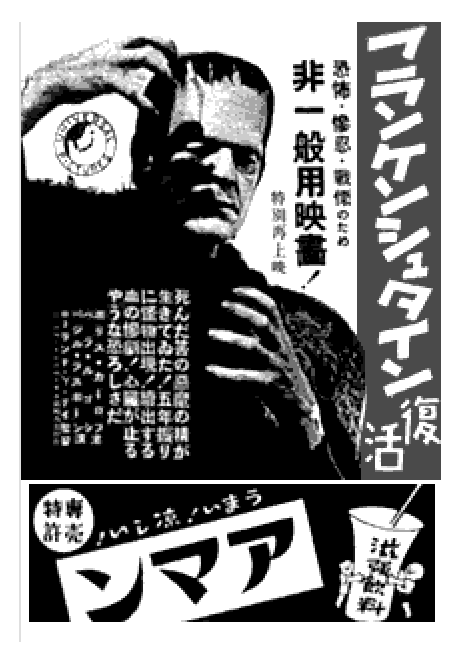 It must be quite a problem to heat, though. 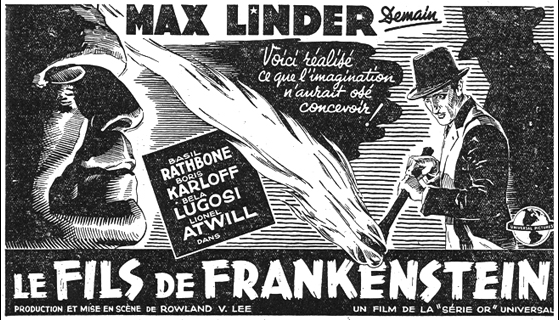 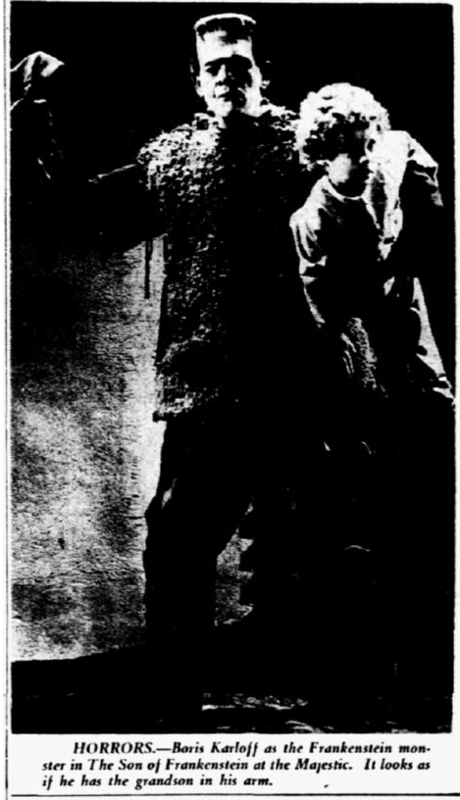 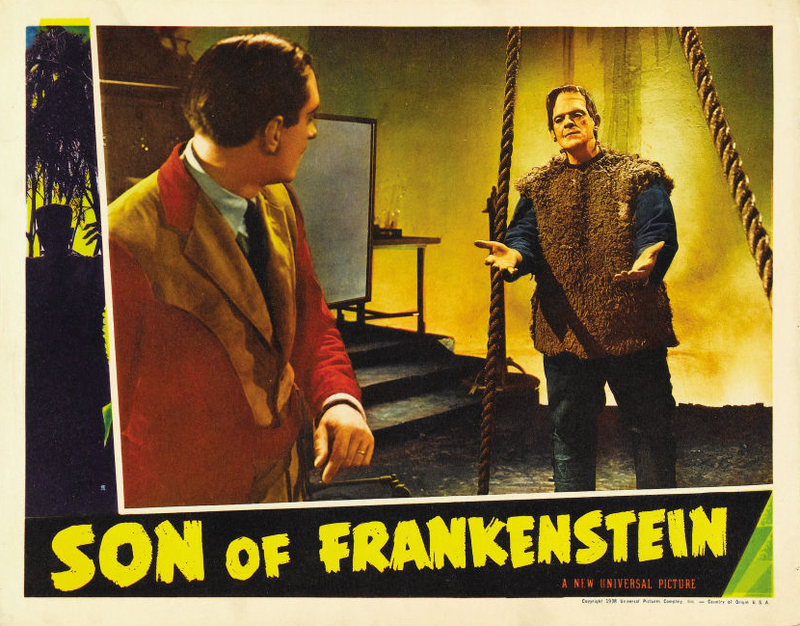 SON OF FRANKENSTEIN, from a screen play by Willis Cooper; directed and produced by Rowland V. Lee for release by Universal. 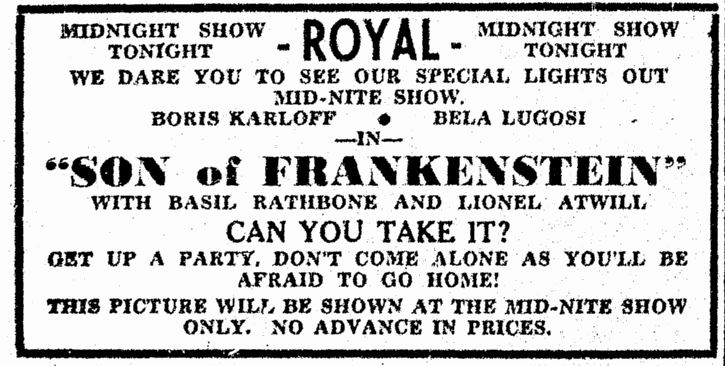 At the Rivoli. 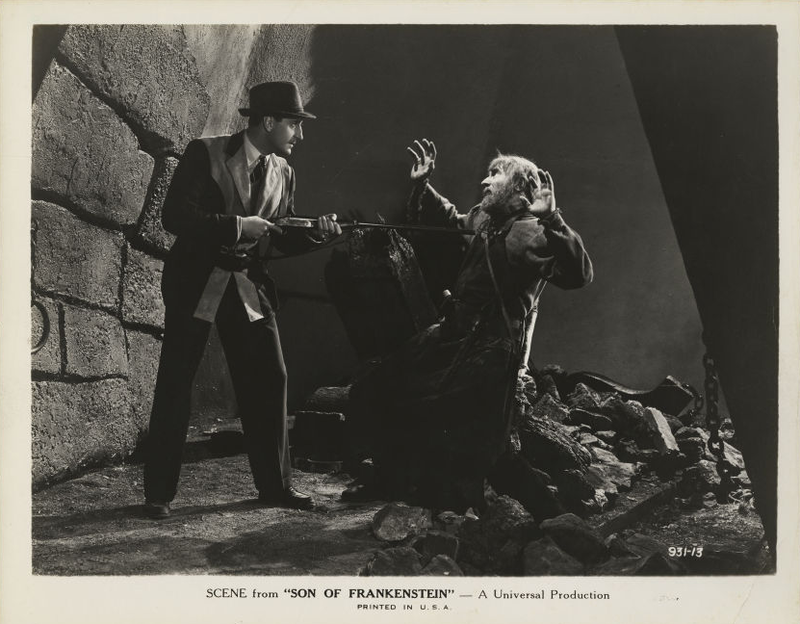 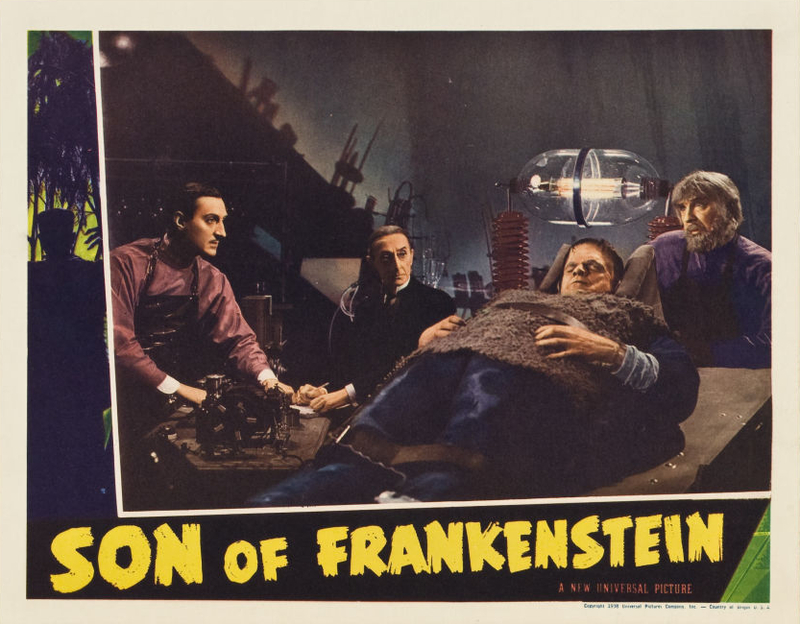 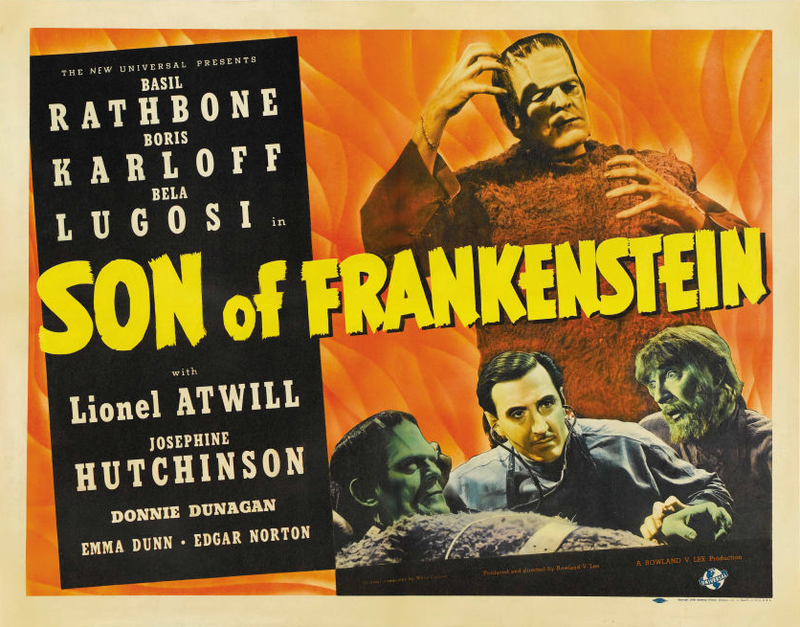 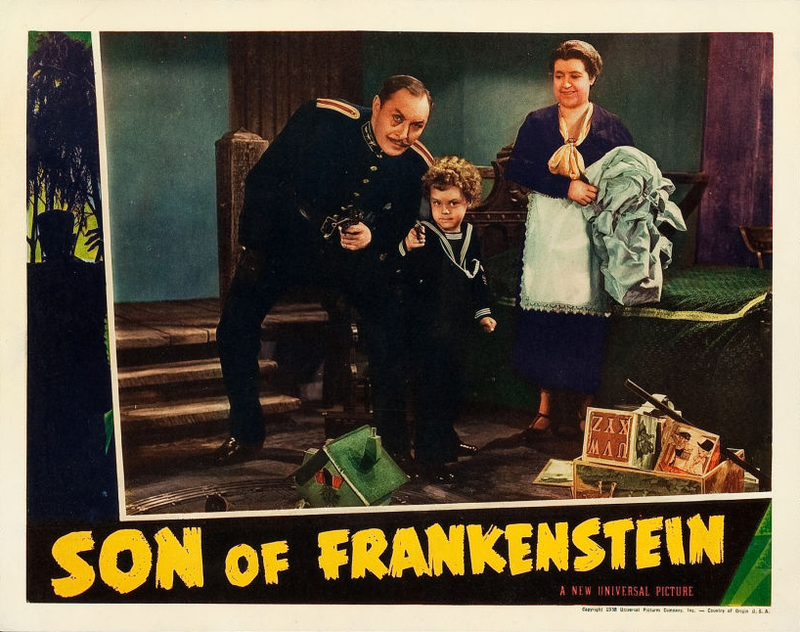 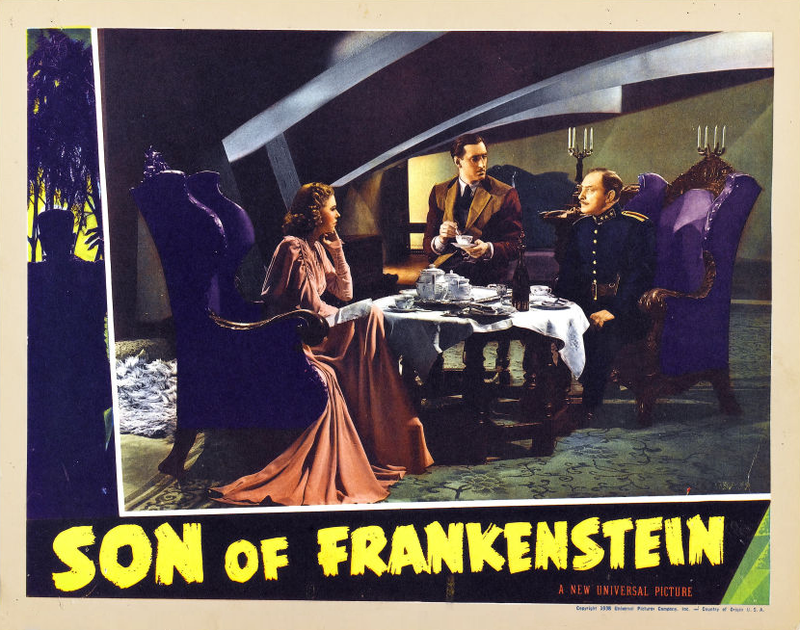 A thriller to end all so-called “horror” films is premiered by General Film Distributors in SON OF FRANKENSTEIN, which is being Trade shown this (Thursday) evening at the Cambridge Theatre. 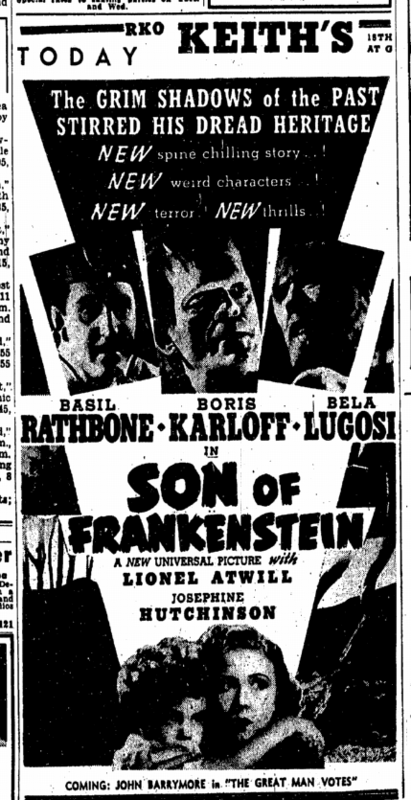 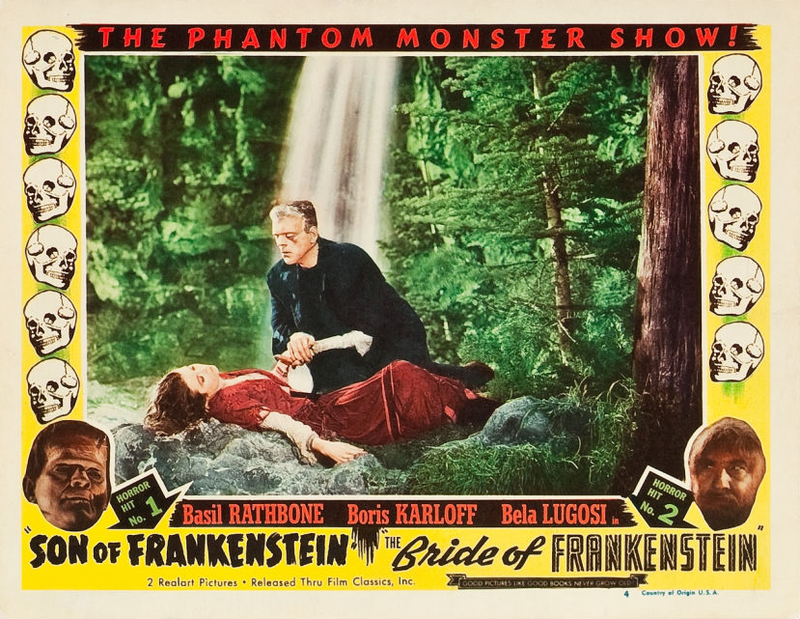 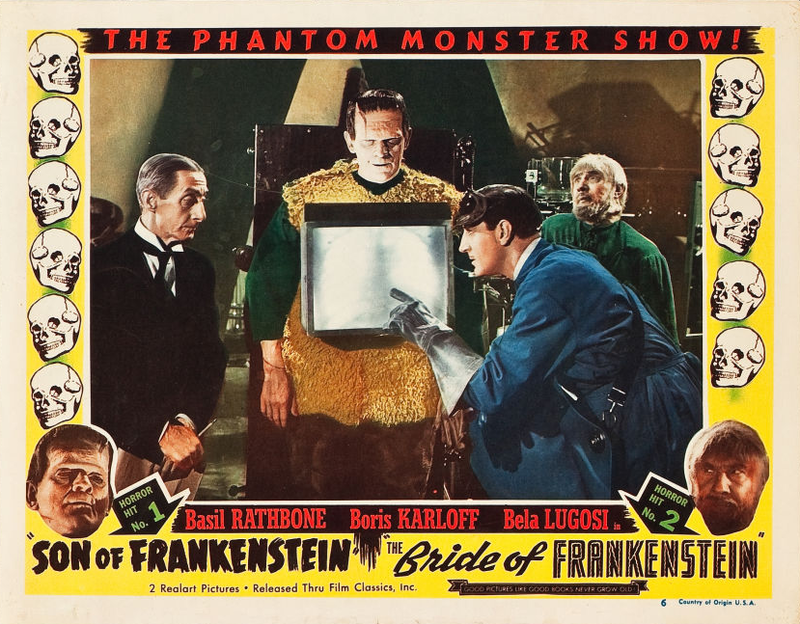 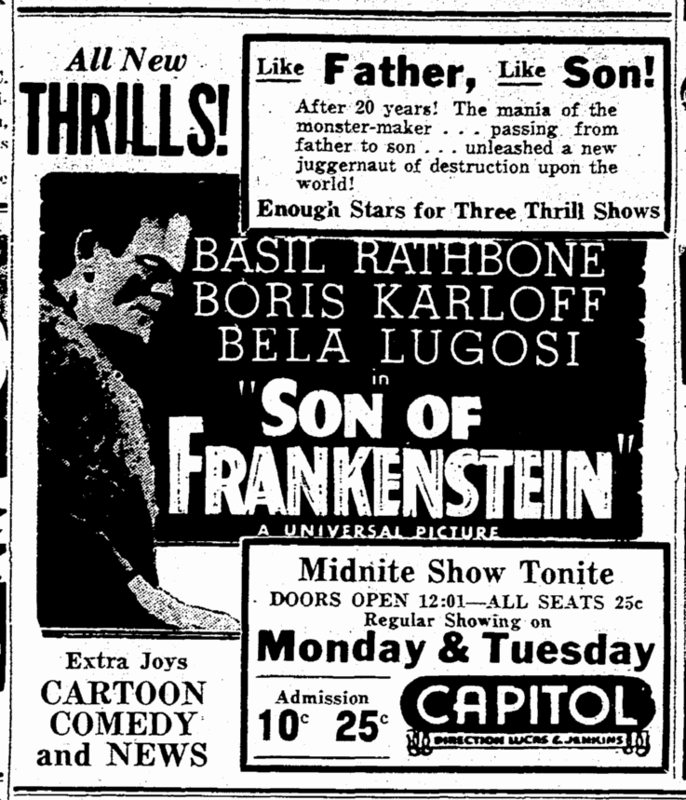 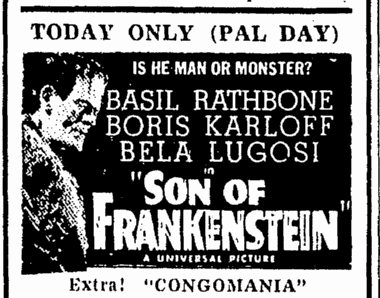 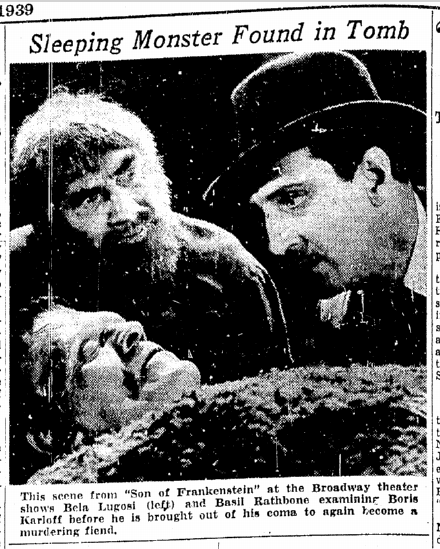 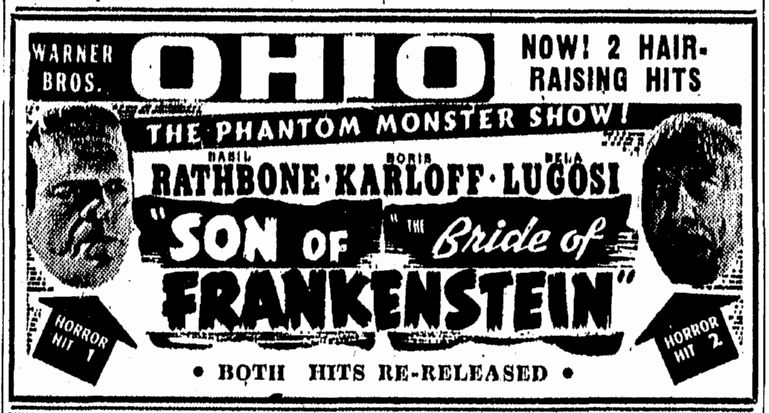 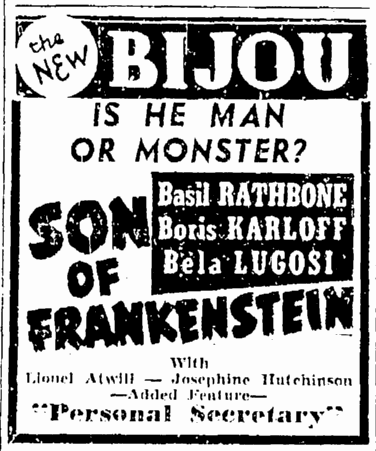 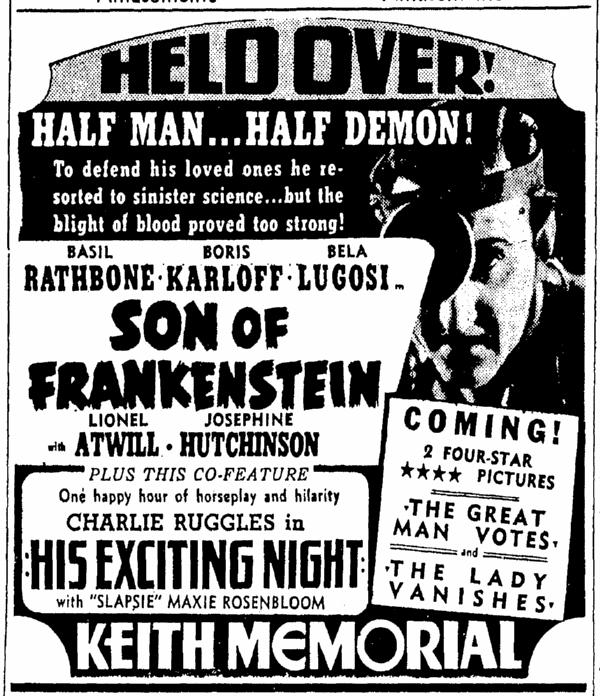 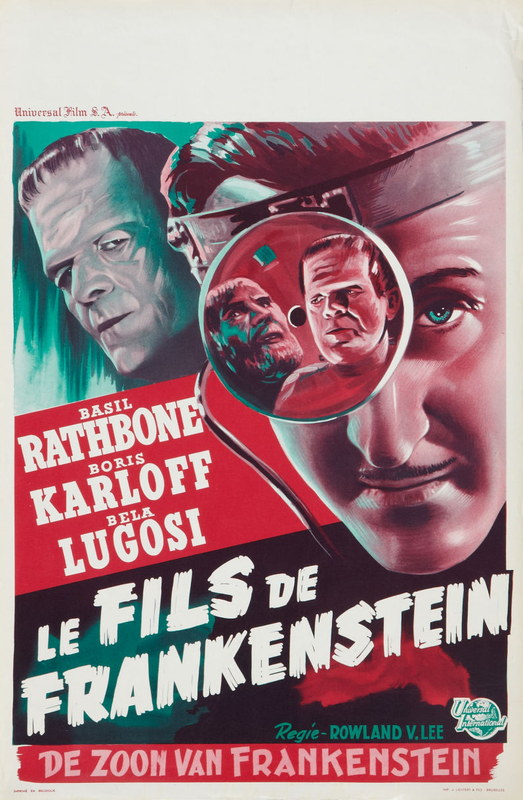 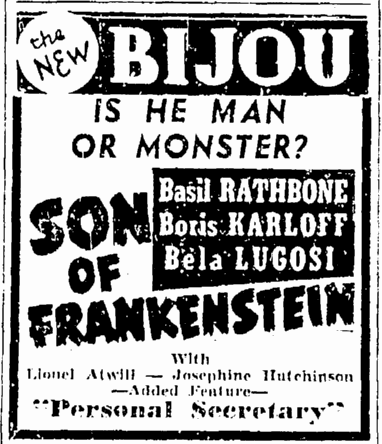 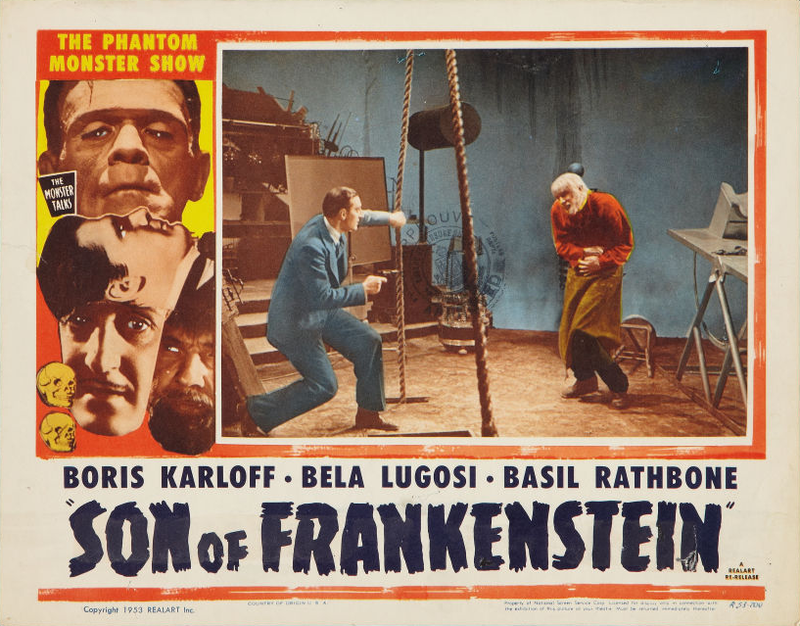 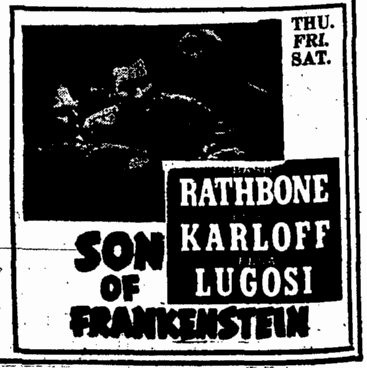 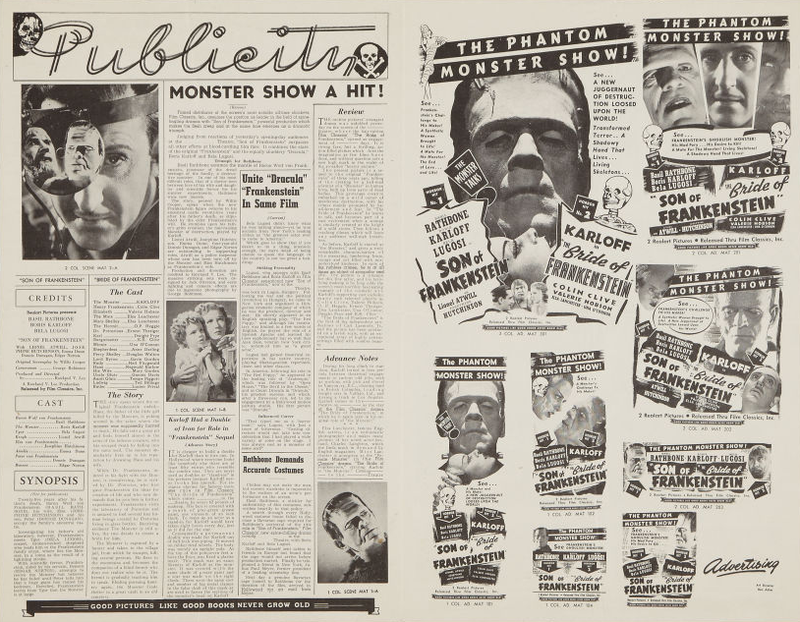 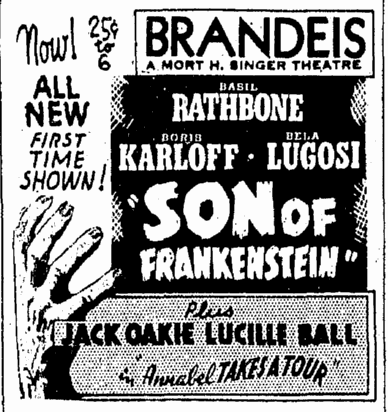 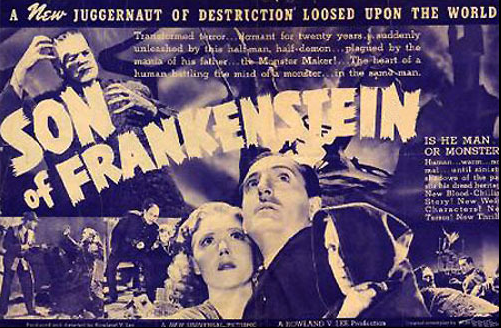 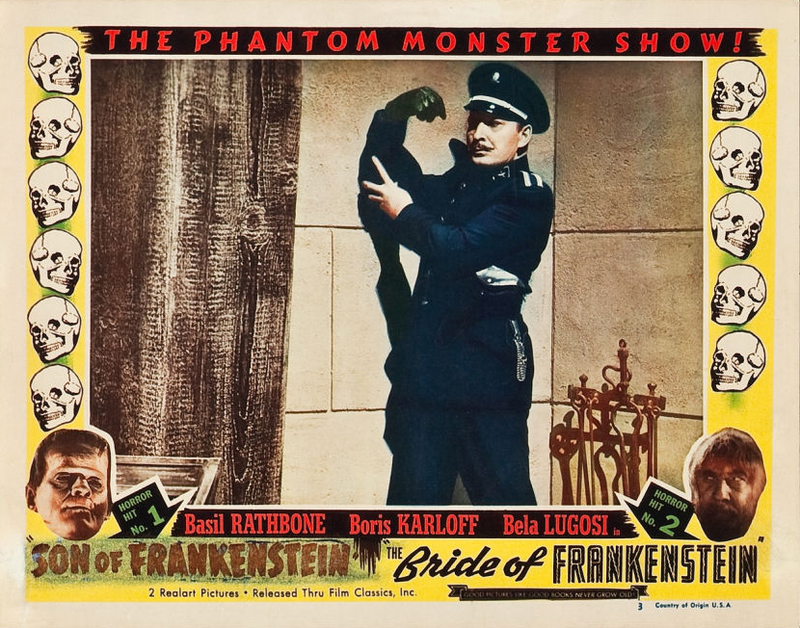 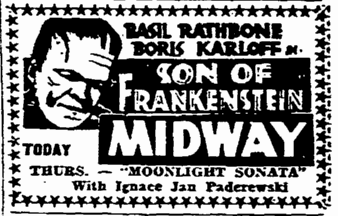 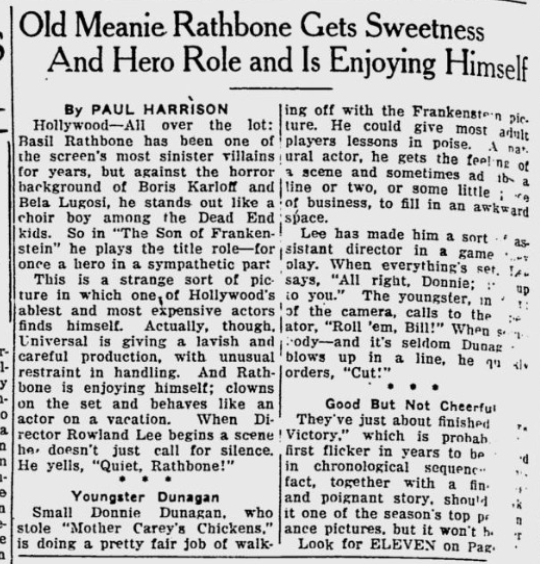 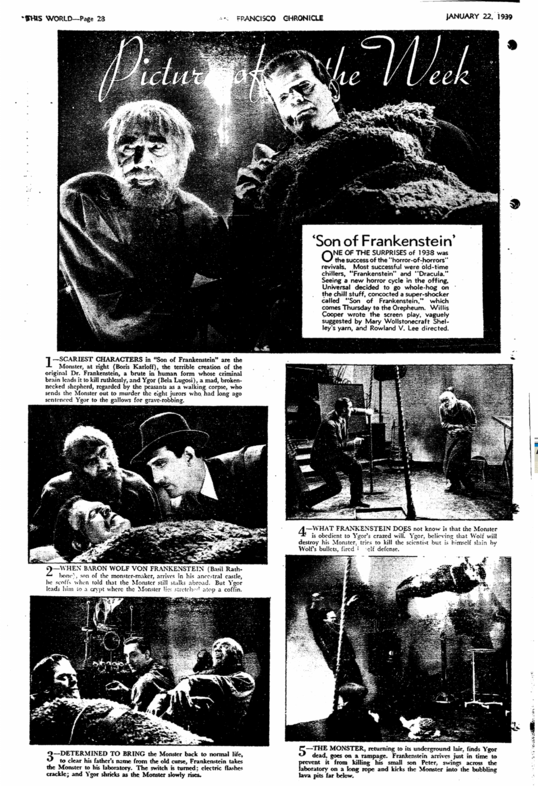 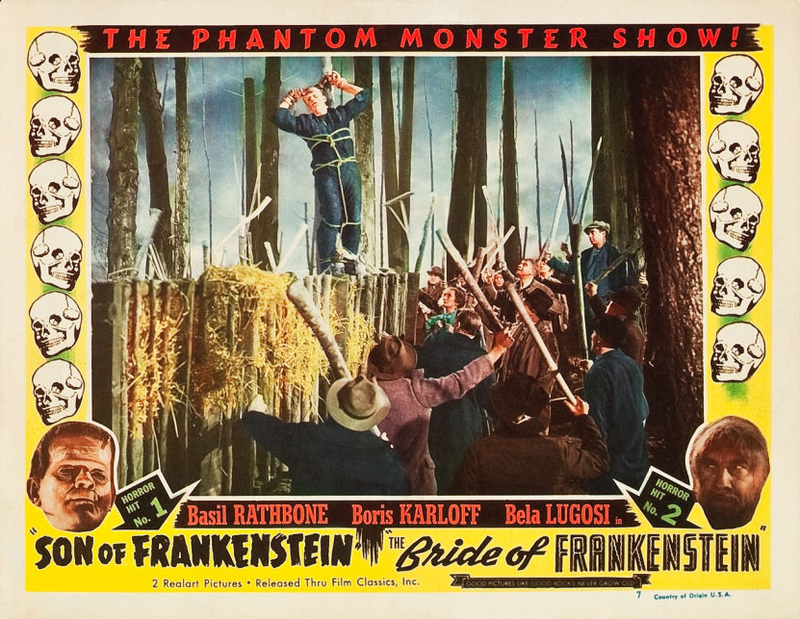 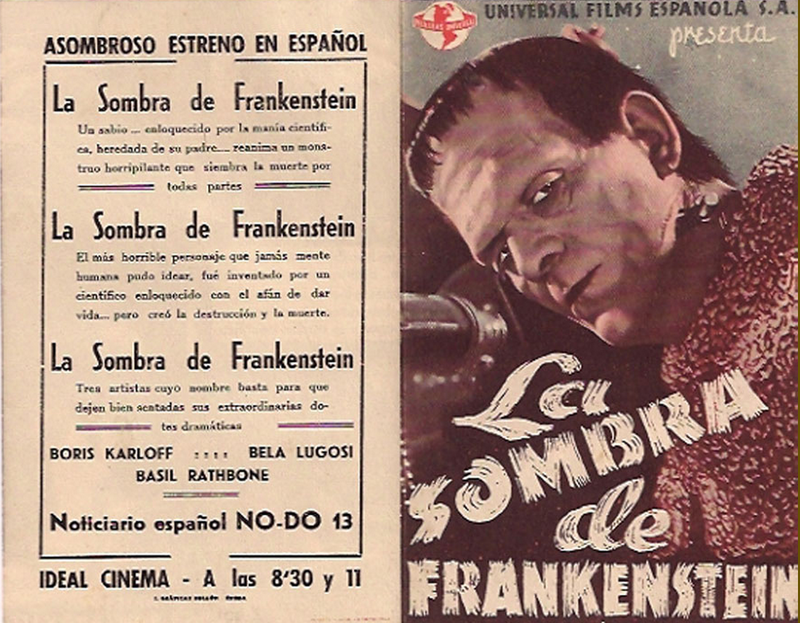 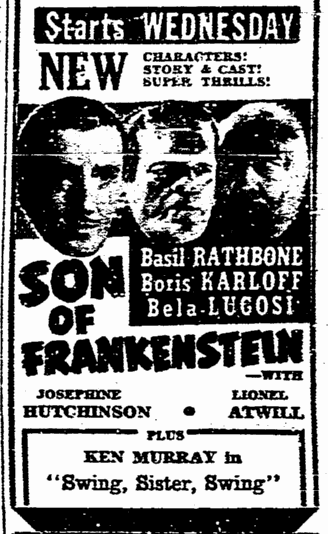 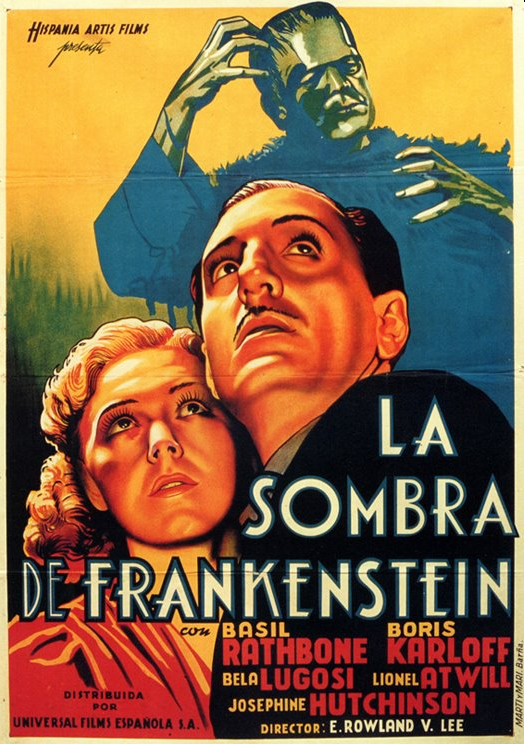 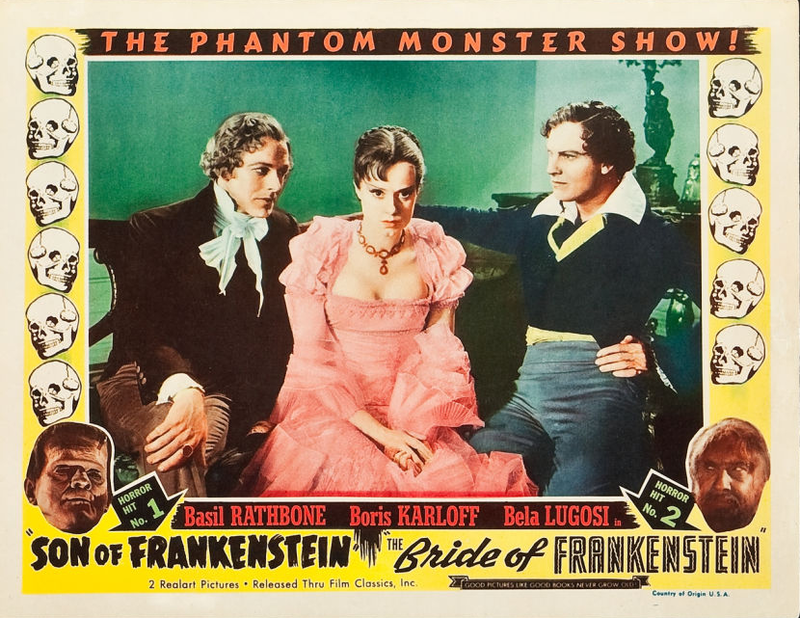 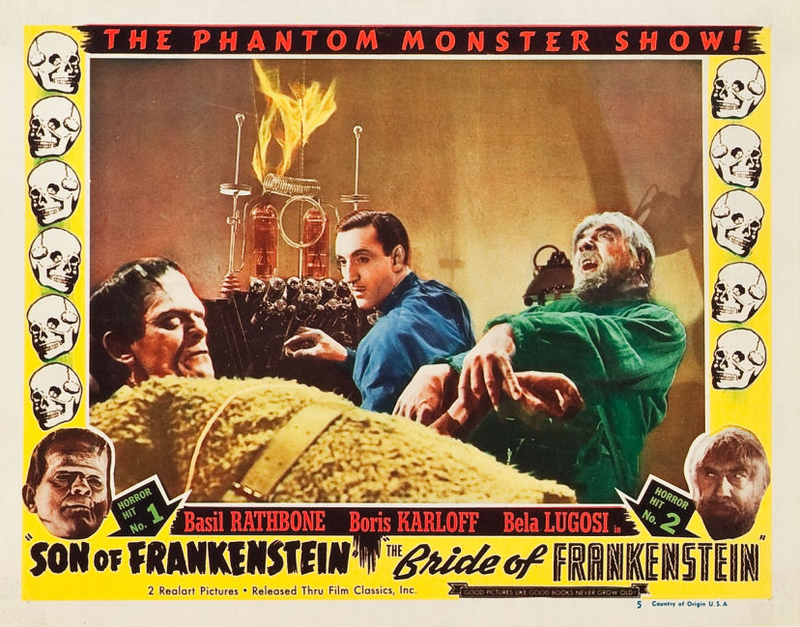 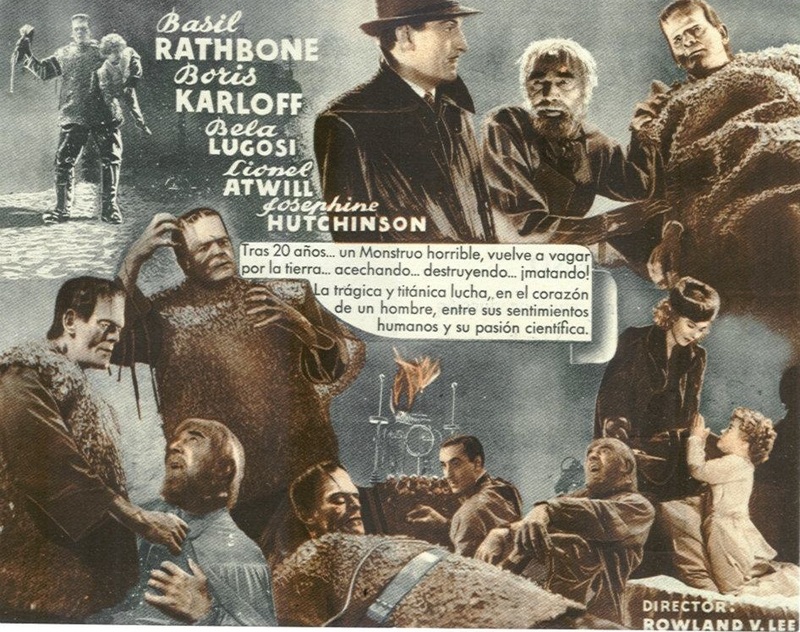 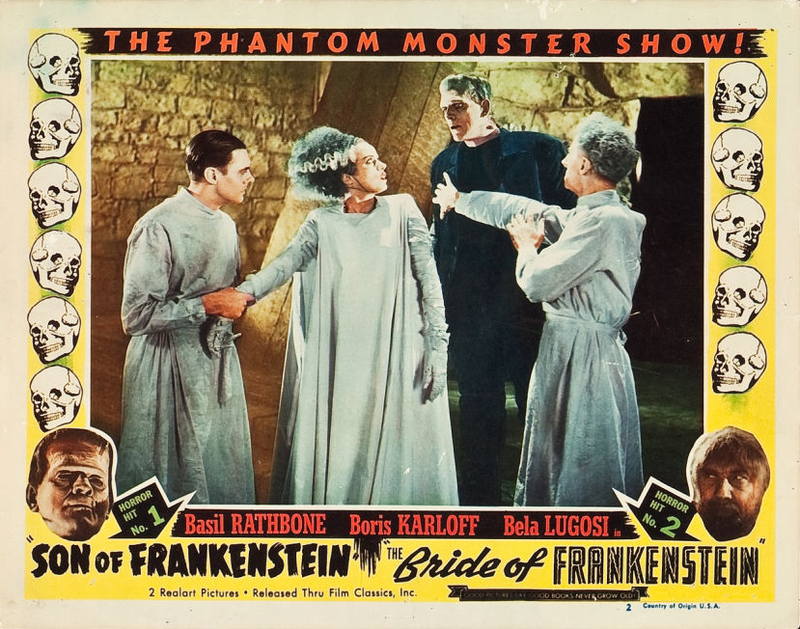 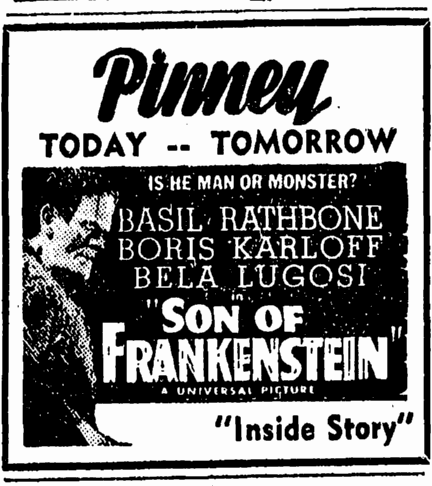 The film, a sequel to the original “Frankenstein,” presents Basil Rathbone in the title role, with Boris Karloff again re-enacting the “Monster.” Bela Lugosi, Lionel Atwill and Josephine Hutchinson are in featured roles. 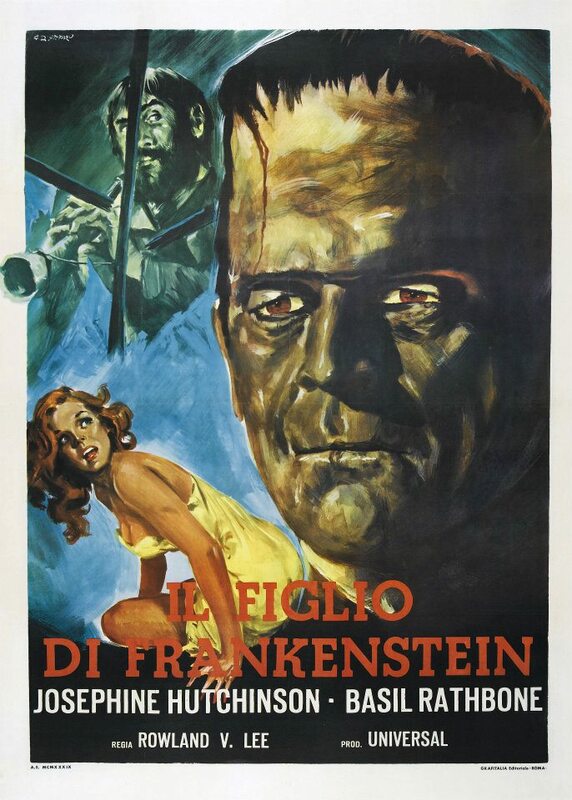 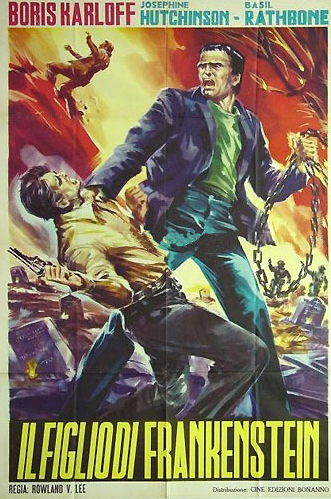 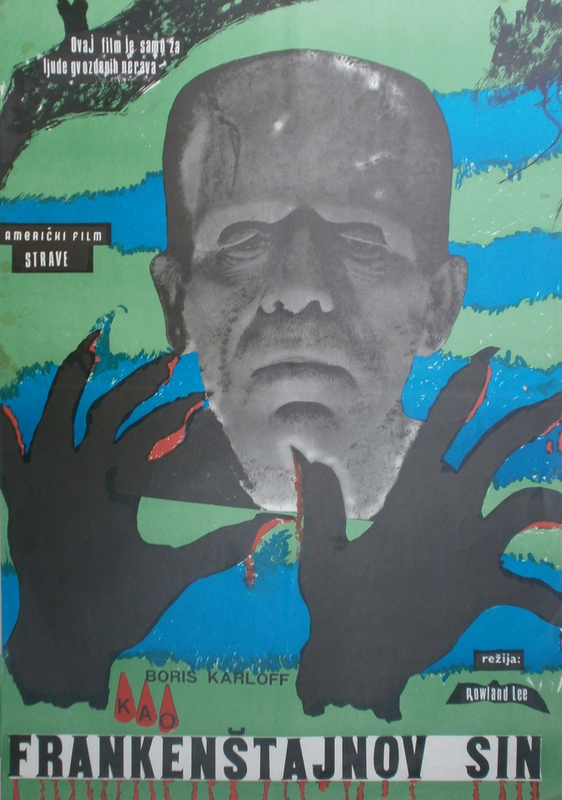 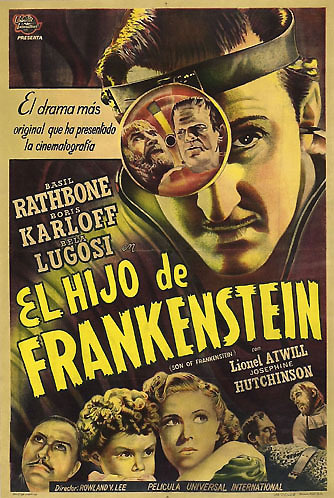 The Turkish release title was Frankenstein’s Revenge. 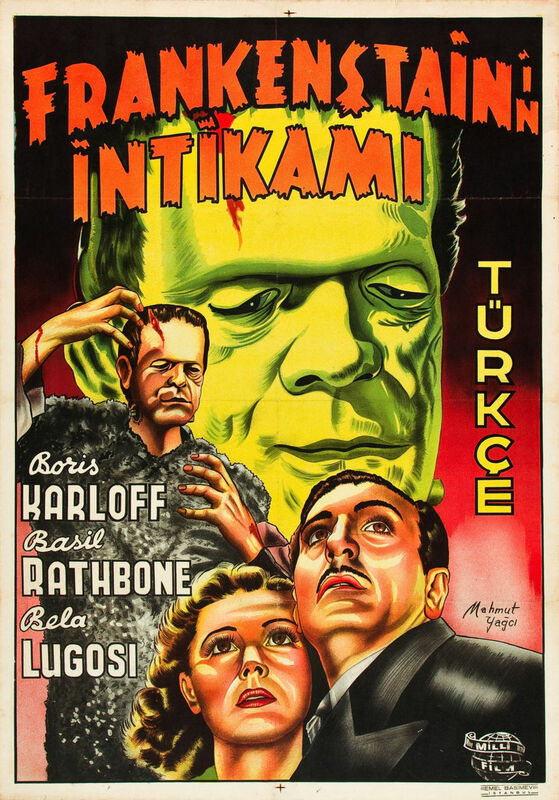 Thanks to Poyraz Baklan for the translation. 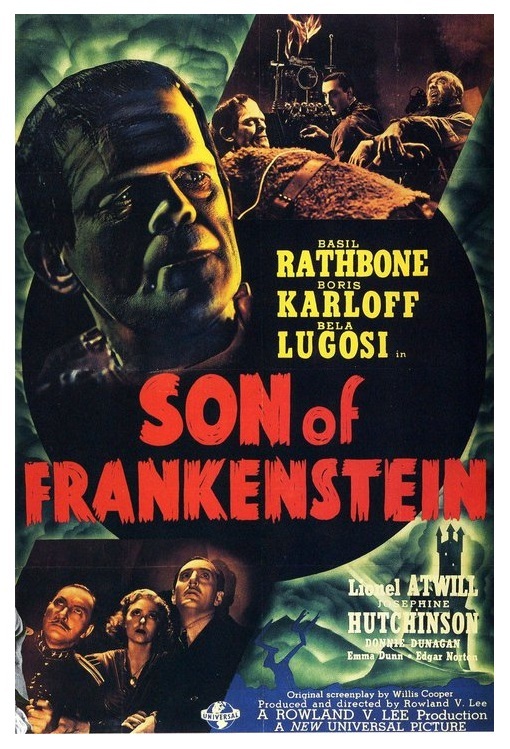 Follow the link below to read the Movie Comics adaptation of Son of Frankenstein.